We will be holding an Open House this Saturday, 20 April from 1PM - 4PM. 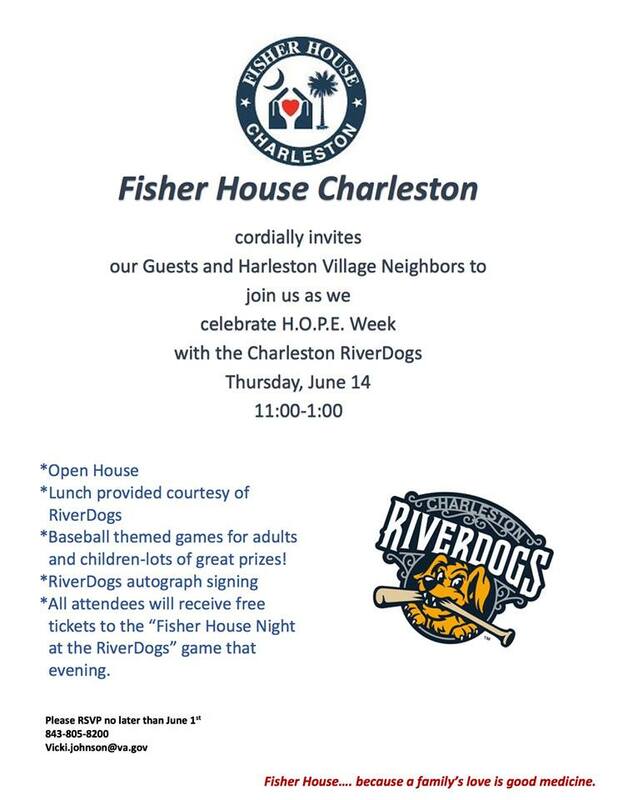 If you are curious to see what we do at Fisher House Charleston, this is an excellent time to stop by. We will try to do this quarterly. 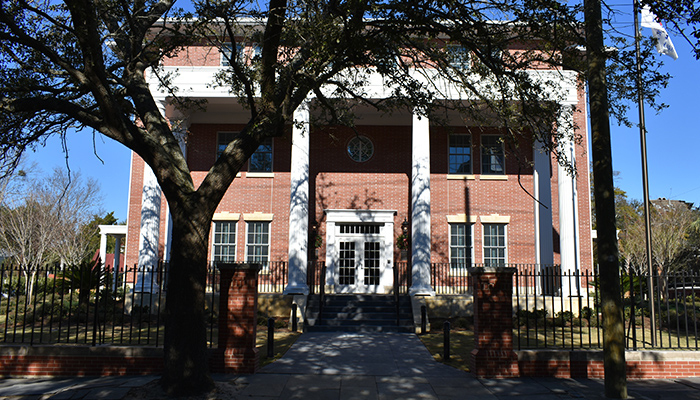 150 Wentworth Street, Charleston! Please direct all communication to Fred Kane fkanesc@hotmail.com or 843.333.7974. Since we opened just over a year ago, we have maintained our House at 70% occupancy or more! 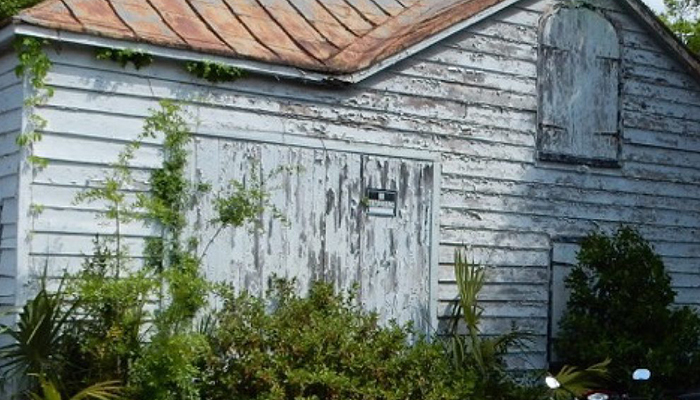 Clearly, we needed a Fisher House in Charleston! 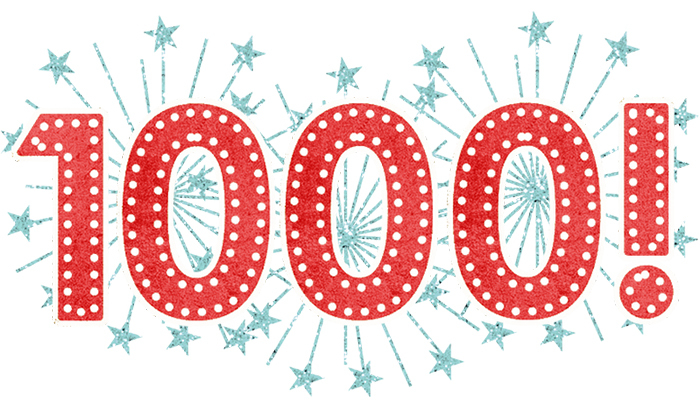 Stay tuned, because we will go over the 1000th Guest really soon!!! 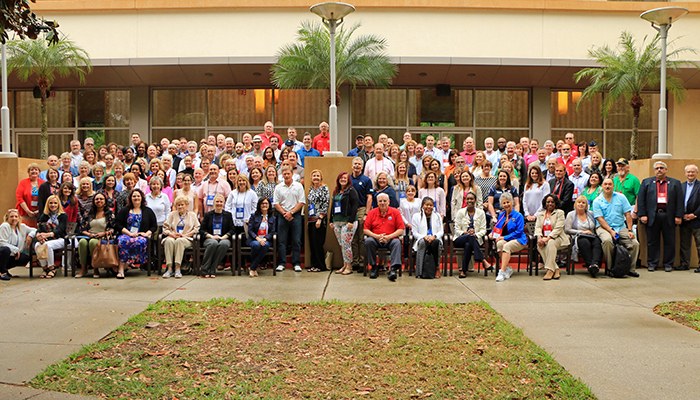 Fisher House Foundation held their annual conference this month. House Managers and their community support groups met to share experiences and discover new ways to support our House. We have returned with great energy and some new ideas! 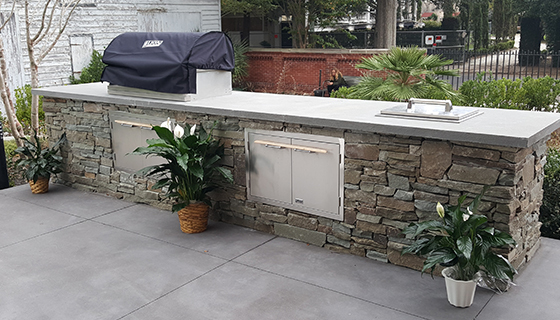 FH Charleston in the 2019 Festival of Houses and Gardens! 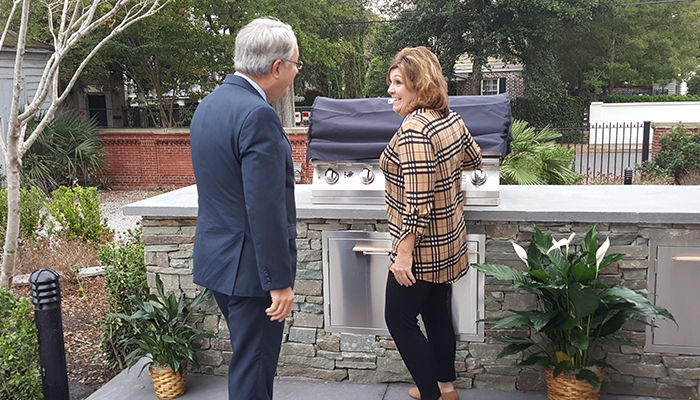 Historic Charleston included Fisher House Charleston in their 2019 Festival of Houses and Gardens! Hundreds of visitors were able to see first hand how our Military, Veterans and their Caregivers are supported by a loving community! 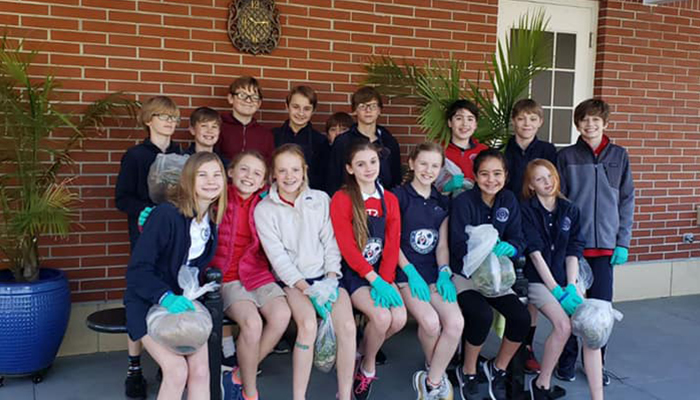 Thank you Charleston Day School for supporting Fisher House Charleston as part of your Mission Possible Day! Nice to have supportive neighbors! 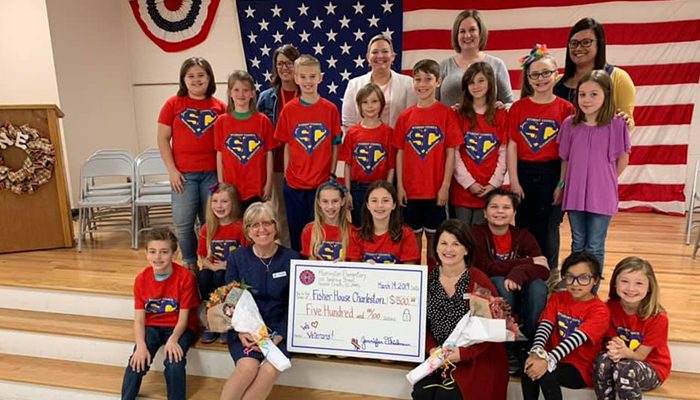 Thank you Marrington Elementary School for your support of Fisher House Charleston! 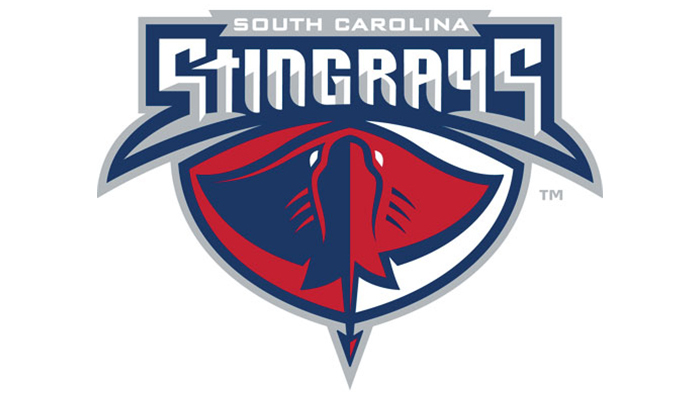 Thank you to the South Carolina Stingrays for featuring us on 16 March! This type of community involvement really helps us help our Military Veterans and their caregivers! Instrumental to our success is having a strong core team to help us get the word out to Military Veterans and their families. We formed the Outreach Committee to do just that. Thank you to General Fedder, Colonel Bauer and Ms. Weiss for being part of the team. If you are part of a group or organization and you would like us to come present about Fisher House Charleston, please message us. Over 900 families served so far! Help us spread the word! LTGEN (Ret) Patricia E. McQuistion, Vice President of the Association of the U. S. Army visited Fisher House Charleston earlier this month to learn how we take care of our Military, Veterans and their families. 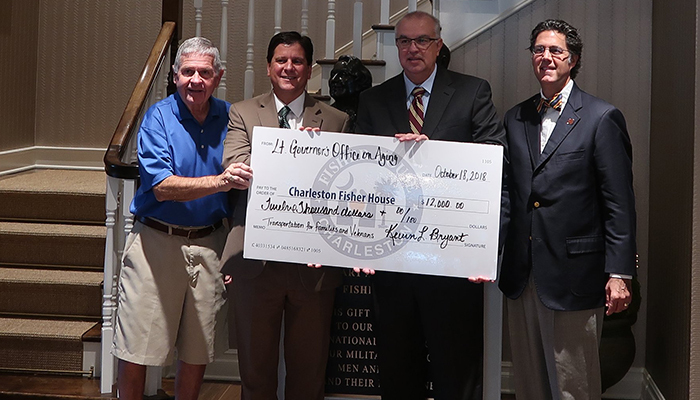 Old St. Andrews Parish Church is a strong supporter of Fisher House Charleston, providing manpower, donations and empathy to support our Veterans and their families! 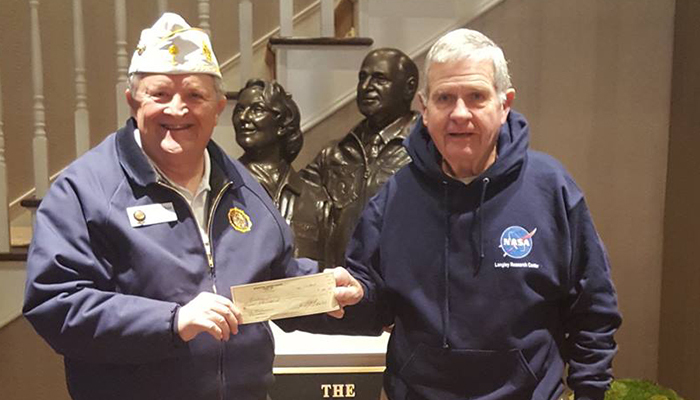 We have always enjoyed tremendous support from the American Legion. Thank you to Post 147 for their generous gift! 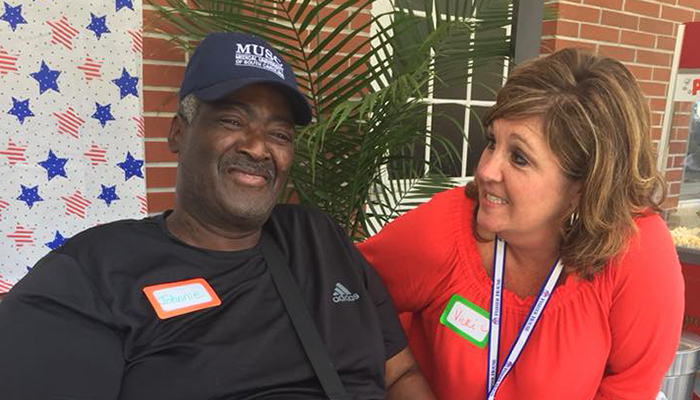 As House Manager, Vicki is responsible for the running of Fisher House Charleston - everything from check-in to maintenance to outreach! 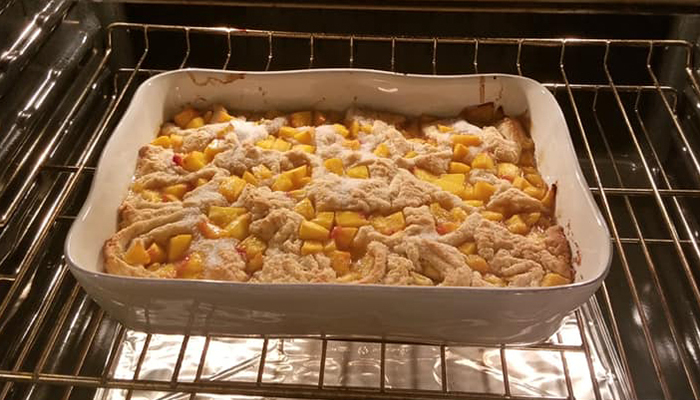 Every once in a while she escapes the endless demands for her time by hiding out in the kitchen and making yummy desserts for our guests! Thanks Vicki! 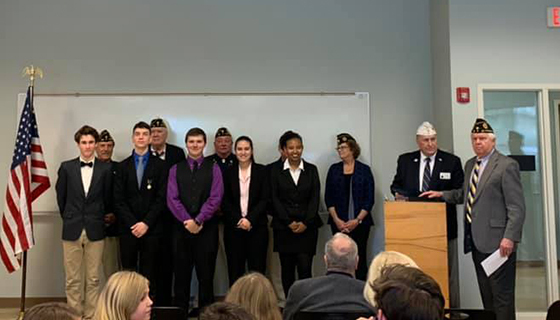 Friends of Fisher House Charleston Executive Director Chris Ward served as a Judge for the American Legion Oratorical's. So many talented young people gathered together; inspiring! Our families love the "Chex Mix Ladies"
Our families love the "Chex Mix Ladies" ❤ Thanks Carol and Penny for your continued support!! 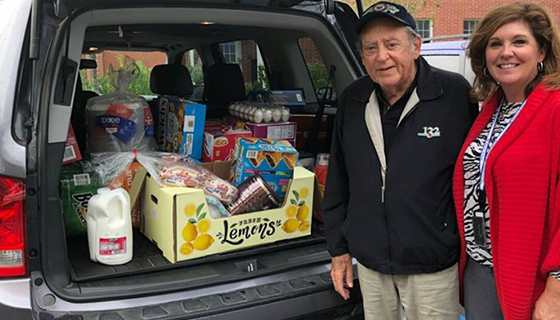 Special thanks to the great folks at Carolina One Real Estate for their wonderful donations for families staying at Fisher House Charleston. 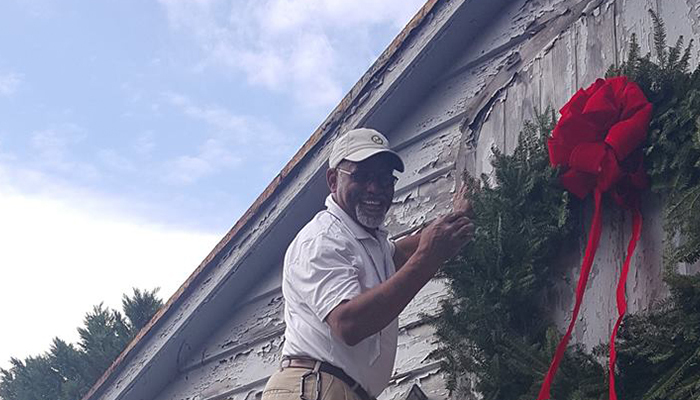 Thank you to Johnny Johnson, Vietnam Veteran and volunteer at Fisher House Charleston. Tonight’s dinner for the families staying with us? Ribs right off the grill! 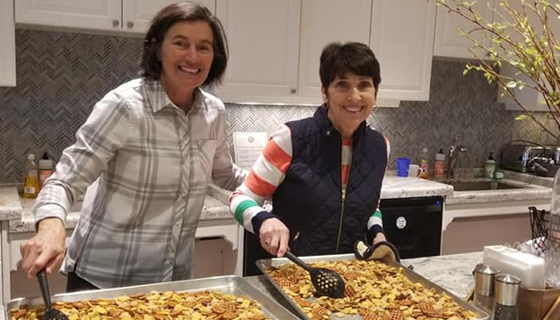 Thank you Trident Hospital's Lowcountry Transitions Behavioral Health for your good humor, contagious smiles.... and great cooking! We couldn't do it without our wonderful volunteers! 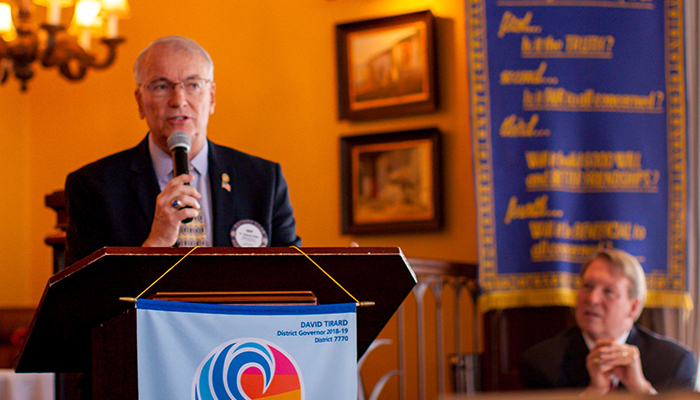 W. Larry Dandridge recently spoke at the Fort Mill, SC Rotary. The Friends of Fisher House Charleston Good Will Ambassador, W. Larry Dandridge recently spoke at the Fort Mill, SC Rotary Lunch Club. US Army Aviation Lieutenant Colonel (Retired) Dandridge talked about the VA Medical System, Fisher House Charleston, the soon-to-be Fisher House Columbia, the US Helicopter War in Vietnam, and the award winning military history and action book that Larry wrote to raise funds for Fisher House Charleston. 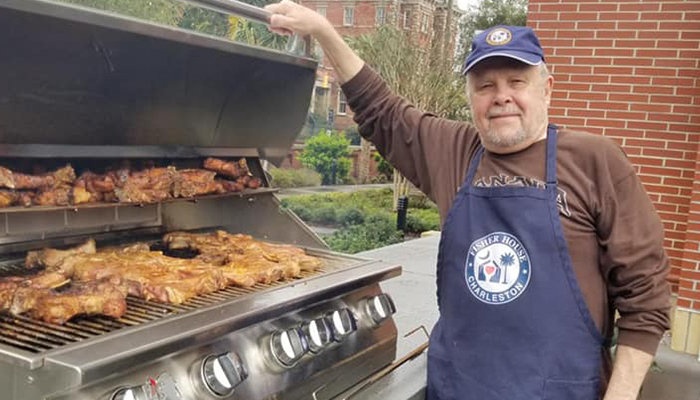 Larry’s book, Blades of Thunder (Book One) and his speeches have raised more than $60,000.00 for Fisher House Charleston. 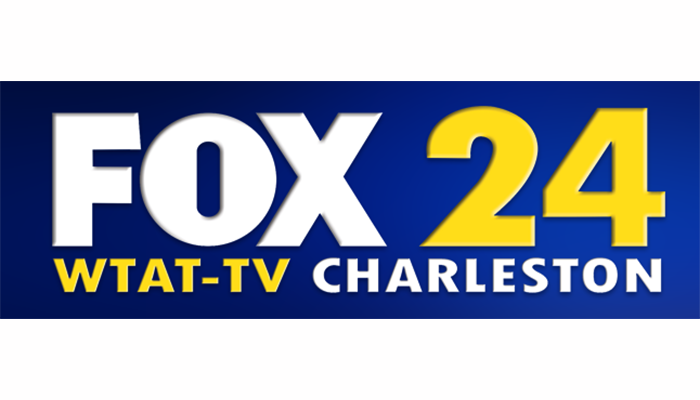 To schedule Larry for a speaking engagement and book signing in support of the Friends of Fisher House Charleston, call Larry at his office at 843-573-9657 or cell phone 843-276-7164 or email him at LDandridge@earthlink.net. 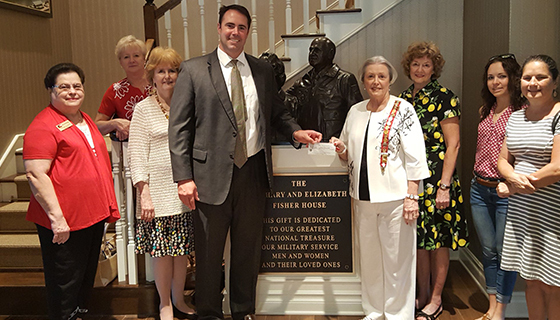 Friends of Fisher House Charleston THANKS LTC Dandridge for his support! 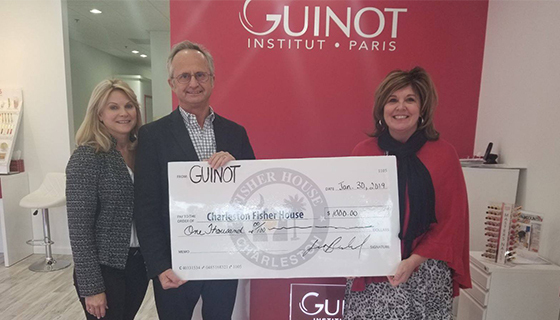 Thank you Guinot Institut Mount Pleasant for your strong support of Fisher House Charleston! 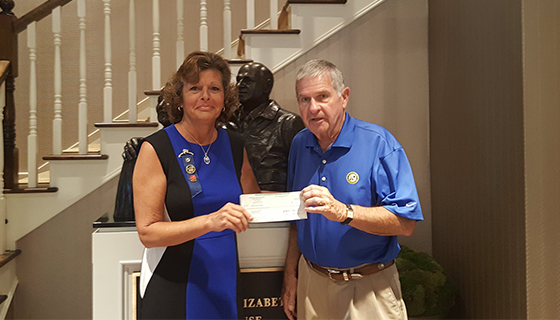 Thank you Charleston Area Men’s Interclub Golf Association for your generous support! Retired Army Nurse Colonel Anne and her husband, Dr. John show up for their first volunteer shift at the Fisher House Charleston, ready to work! 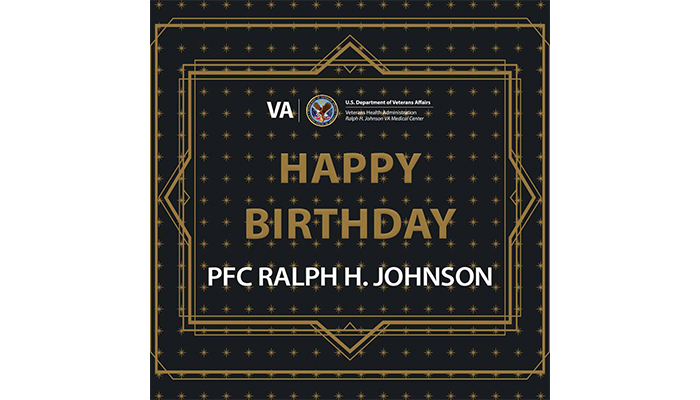 Happy Birthday Ralph H. Johnson! 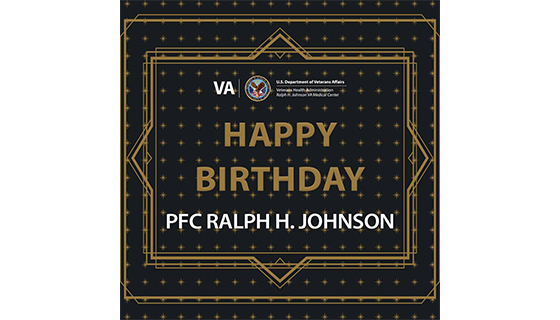 Today is a special day at our medical center - today we celebrate what would have been PFC Ralph H. Johnson's 70th birthday. Happy Birthday Ralph and thank you for letting us be a part of carrying on your legacy of service, courage, selflessness and sacrifice. 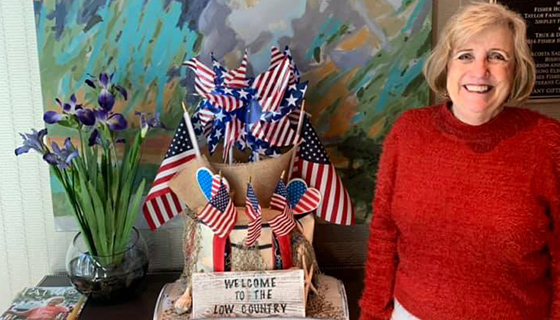 Volunteer Barbara George created this patriotic centerpiece for Fisher House Charleston entryway. Thank you Barbara!!!! 'Tis the season....for giving back! 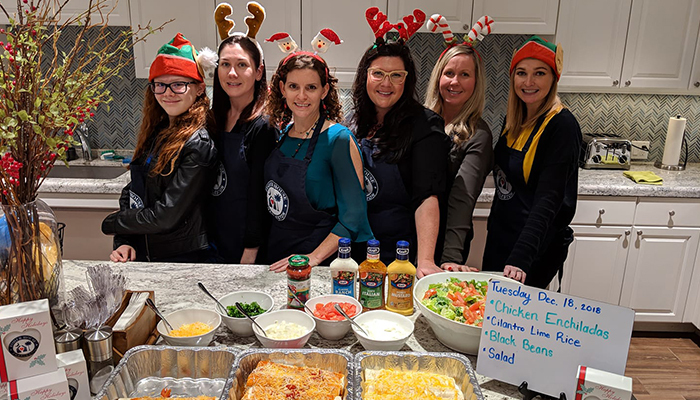 The Young AFCENS had a wonderful time cooking for our Veterans and their families at the Charleston Fisher House tonight! With Jennifer Greenwell, Kristin McCall Smith, Laura Marion and Kelly McCormack. When families stay at Fisher House Charleston they all remark that the house looks spotless........but then they find out that the man that make it so is that really friendly guy Percy who every now and then will admit to his alter ego.......SUPERMAN he even changes with a cell phone!! 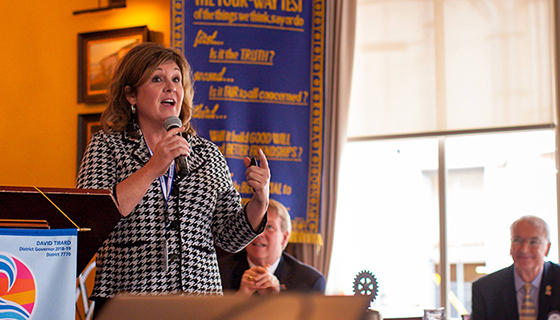 Vicki Johnson visited the Rotary Club of Charleston for their Veteran's Day Program. Valerie Warnock of Geocent presents donation check from their 2018 campaign for Fisher House Charleston. Great support from this North Charleston firm. 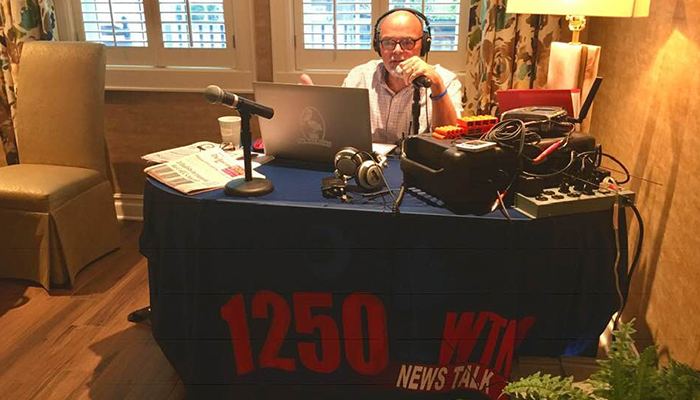 Charlie James of 12150 WTMA broadcasted live from the Fisher House. Thank you Charlie for your support! 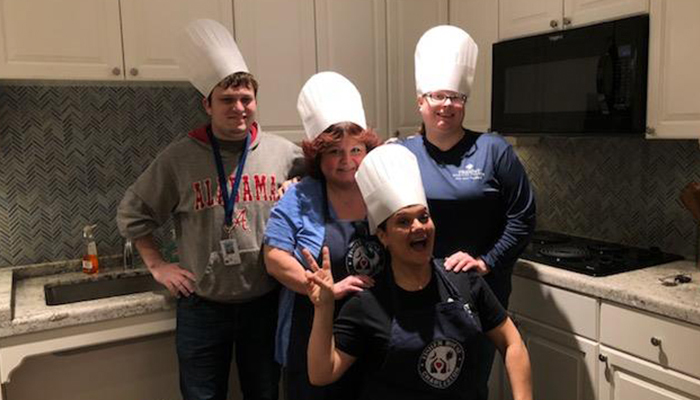 On November 8, 2018 The VA Medical Center's Administrative Executive Council took some extra time out of their evening to prepare dinner for the guests at the Fisher House. Tacos and Chili were on the menu! YUM! So today we visited the Charlie James show on WTMA. He will be broadcasting from the house from 6 to 10 AM on Friday November 9. 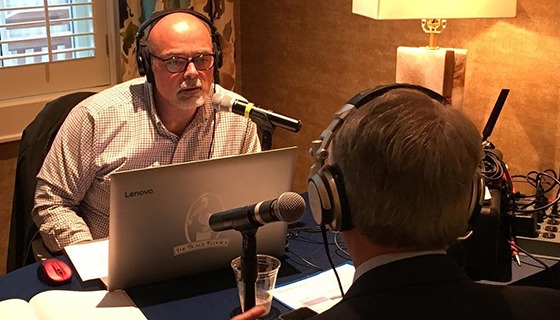 During our on the air discussions we discussed the type of donations that we could use for our guests and how the Fisher House Charleston Radiothon would be structured. USN Veteran Paul Goldberg heard the show and immediately stopped by to get more information from Vicki. A short time late he was back from COSTCO. Thank you Paul..you're #1 and thank you WTMA for what promises to be a very successful campaign supporting our veterans and their families. 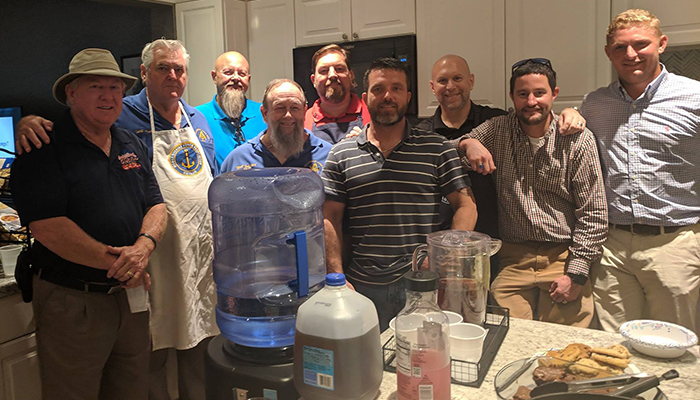 Our web master Phil Reichner www.pandadigitalagency.com and members of Fellowship Masonic Lodge #400 cooked dinner Wednesday night for our guests. Reported best ever! Pictured left to right: Tommy Blackwood, Herb Franklin, Al Couch, Mel Wagner, Jim Rowan II, James Hartnett, Phil Reichner, Larry Anderson, Gage Novaria. 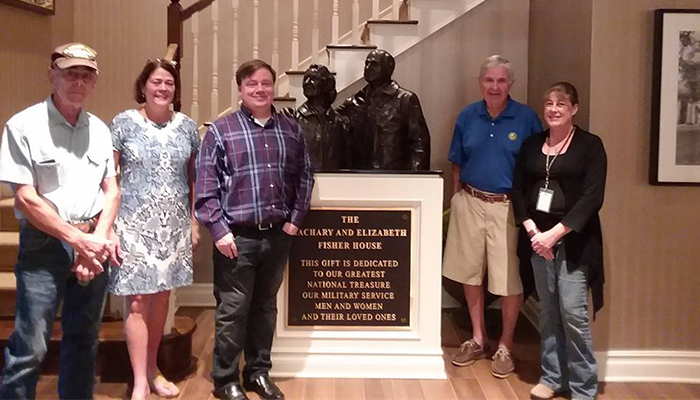 On Wednesday October 10 the Daniel Island Exchange Club visited and toured the beautiful new Fisher House of Charleston residence. Pictured left to right are Jim Herzog, Joe Delpino, Sandy Dominick, Alexandra Lanza and Pam Delpino. 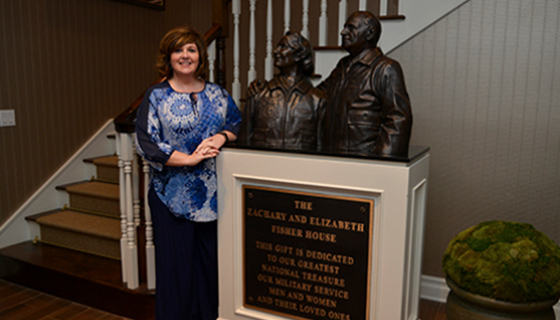 The busts are of Elizabeth and Zachary Fisher, the original founders of Fisher House. We are proud to support Fisher House. 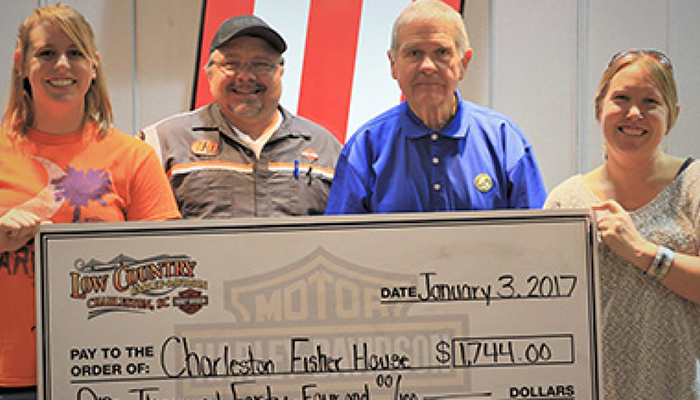 Fisher House Charleston Managers receive a very generous $1500 donation from Summerville Masonic Lodge #234. [L-R] Chris Jackson, Worshipful Master James Harmon, Vicki Johnson and Master Mason Tony Lowder. We are grateful for this support to our veterans and their families. German Friendly Society President Hugh Tant presents Vicki a very generous $500 donation........thanks for supporting our veterans and their families. 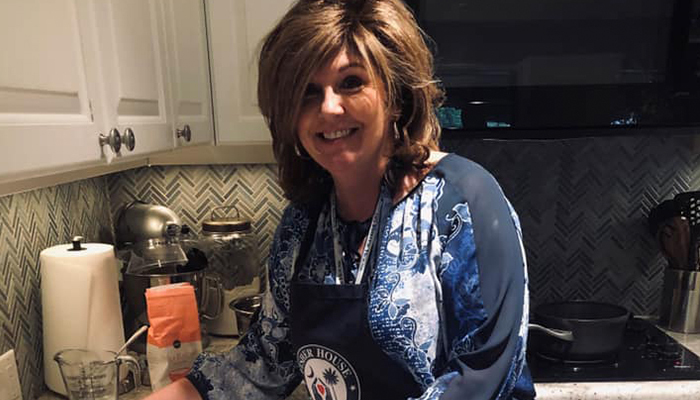 Would you like to cook dinner for the Fisher House? 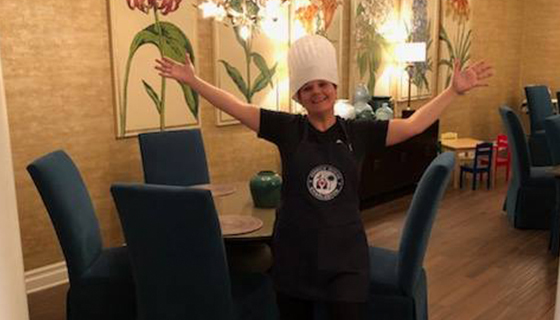 Would you like to cook dinner for the residents of the Fisher House? By clinking the link below, you will be redirected to the Meal Train for Fisher House Charleston. 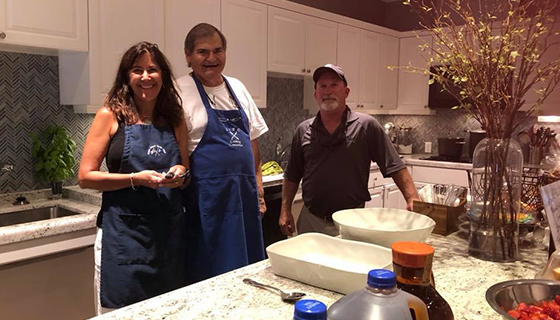 Charlie Aimar, Mary Anne Lilienthal Aimar and Bill McDaniel from the James Island Yacht Club cooked dinner for the residence of the Fisher House. Crowfield Men's Golf Association presents Fisher House Charleston's House Manager Vicki Johnson a $600 check from last Saturday's event. Did we mention we also have great volunteers from Crowfield? Thanks to all who support our veterans. 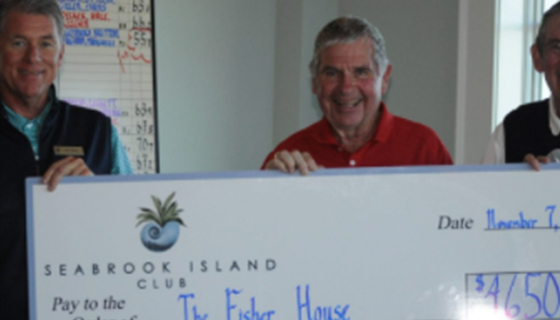 James Island Yacht Club presented more donations from their events supporting Fisher House Charleston.......almost $40,000 to date. 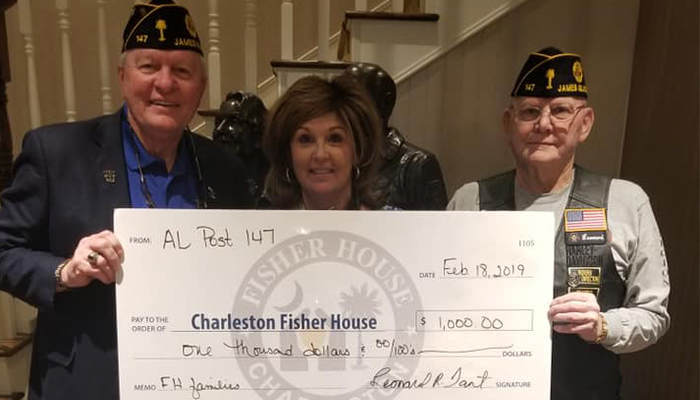 Judy Hennis President of American Legion Auxiliary South Carolina presents a donation from her year long project supporting Fisher House Charleston. A huge and generous contribution. We are thankful for this support to our veterans. 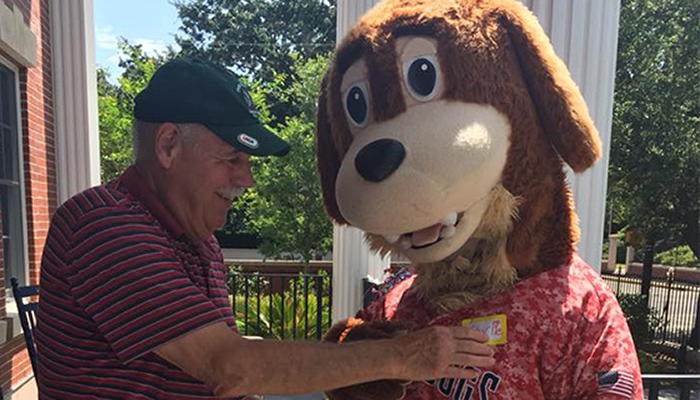 Charlie and the Riverdogs players were ready to serve our Veterans and their families at Fisher House Charleston today - great food and fun! Join us for Fisher House Charleston Night at The Joe this evening. 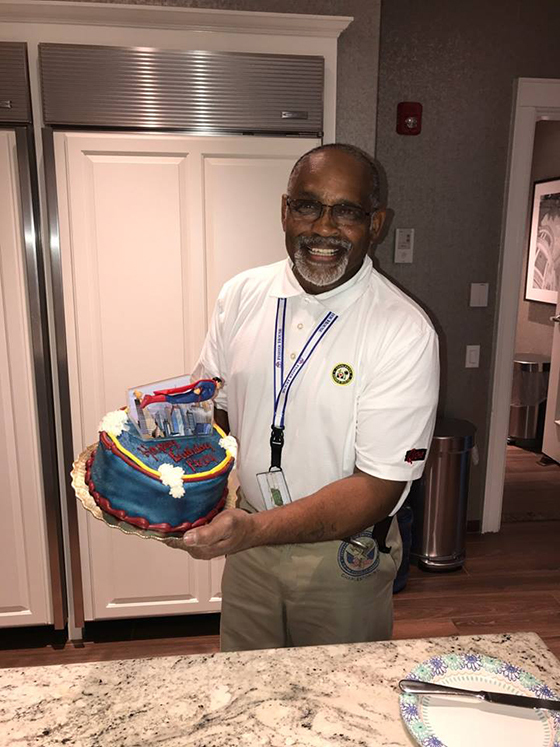 Fisher House Charleston guest Johnnie Hicks said, “If there was anything better than this, God would have to bring it.” To Mr. Hicks and all of our Fisher House families, it is an honor to serve you! 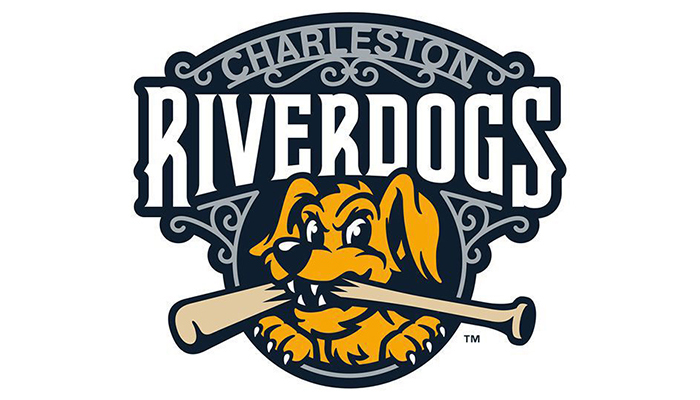 Charleston River Dogs host the Harleston Village neighbors for a pre-game lunch. 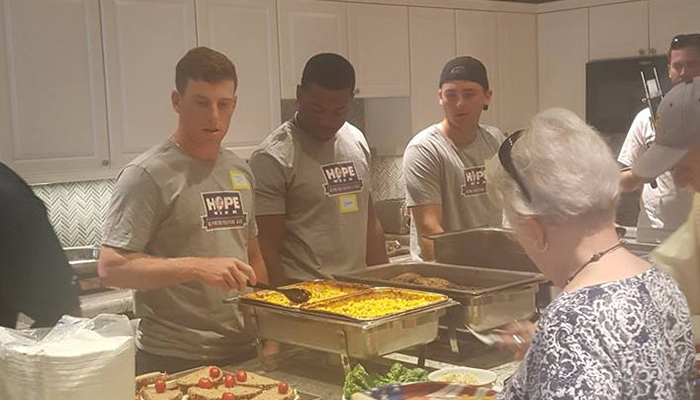 For Day Four of Yankees #HOPEWeek Pitchers JP Sears, Dalton Lehnen, Outfielder Steven Sensley, and RiverDogs staff served food and hosted an Open House at The Fisher House Charleston with current residents and active and veteran military members. 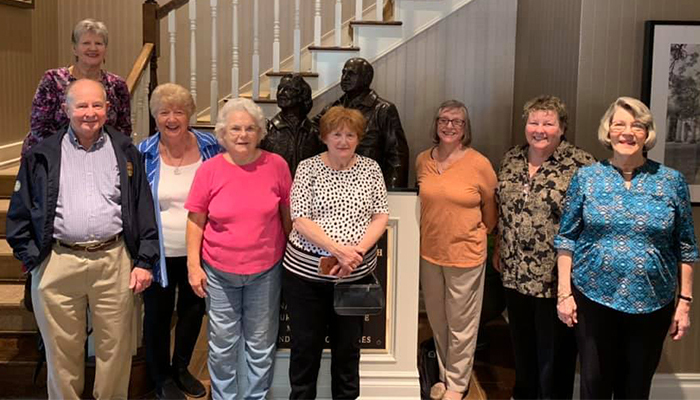 United Daughters of Confederacy C Irvine Walker Chapter #190 present a donation to President Josh Strimple......[l-r]Mary Lee Rogers,Benita Kinlaw, Linda Sargent, Josh, Carolyn Arnold, Barbara Simmons, Kimberlee Lisicki and Martha Lisicki. 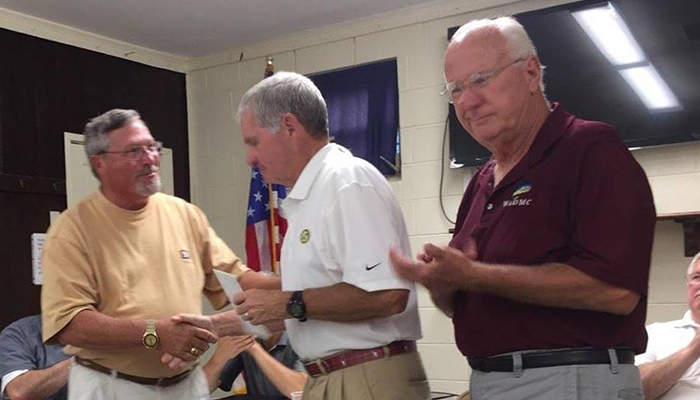 West Ashley Outboard Motor Club President Mickey Thompson and Bruce Saxman present a Most Generous donation at their May meeting last night.......THX for your support! 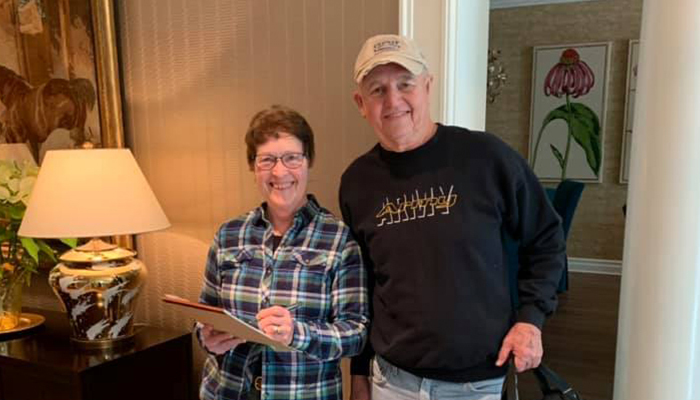 Our Friends at Baldwin & Associates CPA who maintain our financial and tax records made a visit Friday to see what they have been supporting since 2013. From right to left Dawn Goehring, Scott Schlau, Alys Anne Dennis and Dawn's father Lou. 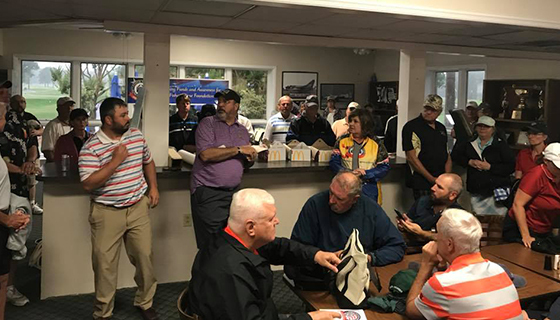 I was honored this rainy morning to welcome a packed room of golfers / Veterans to the Friends Of Fisher House Charleston/Grand Strand Golf Tournament at Whispering Pines Golf Course! 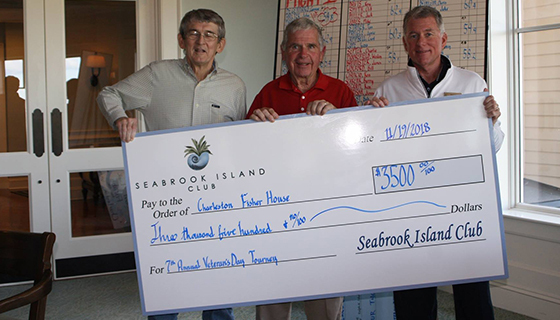 Thank you to Fred Kane, who organized this incredible fundraising event for Fisher House Charleston, which has served over 75,000 families of Veterans from 22 coastal counties receiving medical care in Charleston! 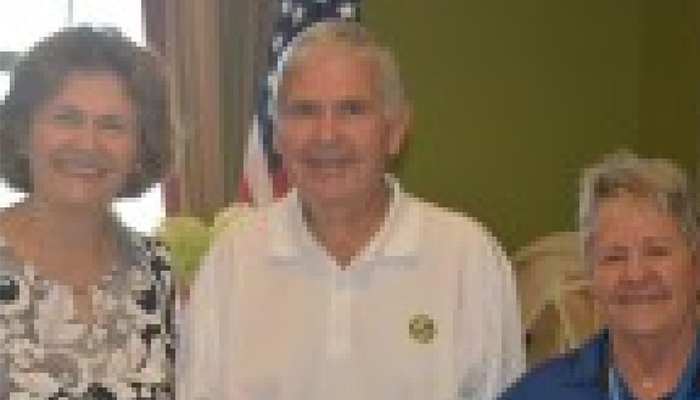 Quote of the morning: “There is no charge for Veterans and their families at Fisher House because they have already paid the price!” God bless Fred Kane and Grand Strand supporters of Fisher House! God bless America’s Veterans! PS: Happy 60th Birthday, Fred Kane!!! 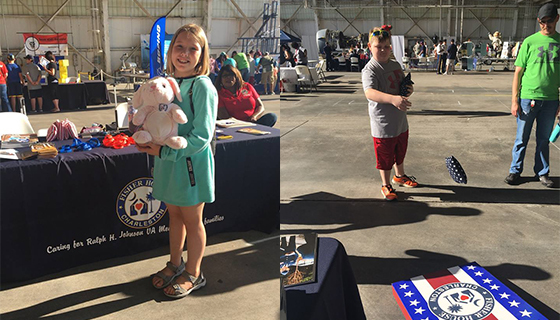 Thanks to everyone for visiting our table at Joint Base Charleston Air Show. Corn hole boards and prizes were very popular with the kids. The Fisher House Charleston is a resource available to service members, veterans, and their families to utilize while they’re receiving medical treatment at the Ralph H. Johnson Veteran Affairs Medical Center which serves nearly 75,000 veterans and service members from Myrtle Beach, S.C. to Savannah, Ga. 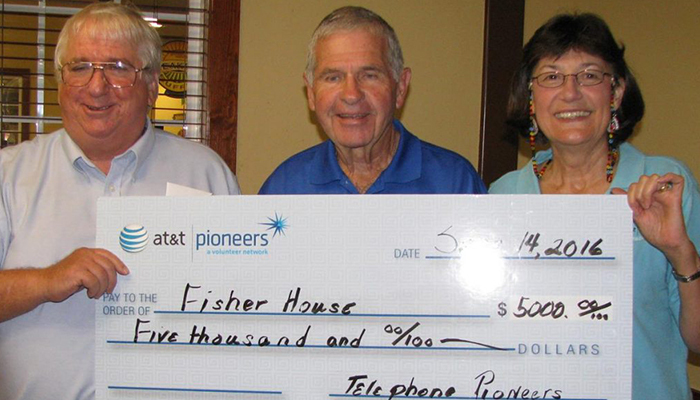 According to Johnson, the community came together to raise money to purchase the land that the Fisher House now sits on. The Fisher House has 16 suits available to families as well as a taxi service, and a fully stocked kitchen. 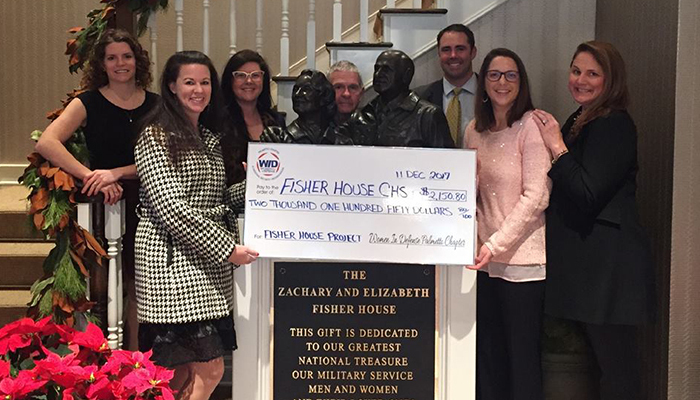 The VA runs the house but the Friends of the Fisher House raise money to provide the extra amenities at the house. They also provide a taxi service to and from the medical center. According to the Fisher House website, “Family is the best medicine”, and states that the proximity of family to an individual receiving medical care not only speeds up recovery, but also reduces the likelyhood of readmission. 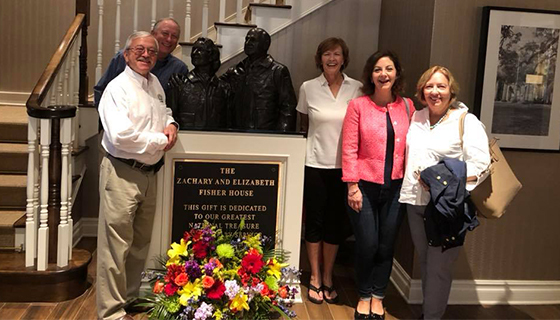 For one couple, Danny and Alice Turner who have been married for nearly 29 years, the importance of being able to be together at the Fisher House has been invaluable. 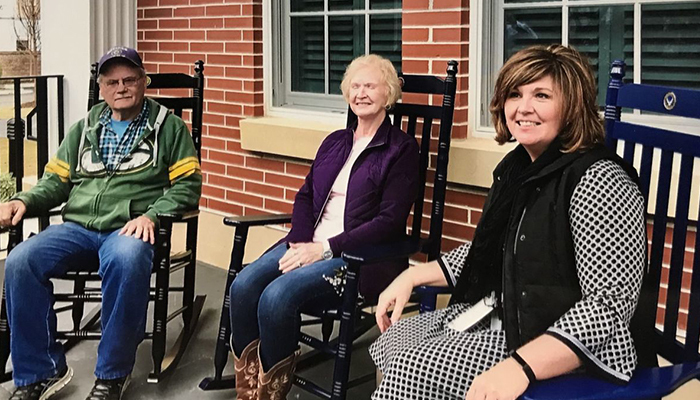 The couple travels over two hours on the weekends to stay at the Fisher House while receiving care at the medical center. After their first weekend at the house they described how they were actually looking forward to returning to the Fisher House. When Milinda Anderson learned of a way to help the newly-established Fisher House in Charleston, a home-away-from-home for families of sick veterans, she jumped at the opportunity. Her mind immediately flooded with memories of her grandpa, a World War II Army veteran. 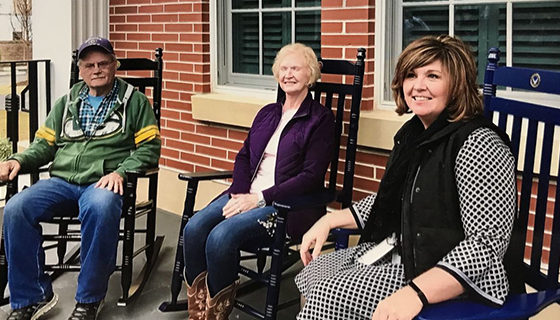 The retail manager of the Cracker Barrel store in Summerville, Anderson was contacted last month by the Veterans of Foreign Wars Auxiliary 3433 in Ladson about donating hand-painted rocking chairs for the Fisher House front porch. "When they said 'the Fisher House,' that was all they had to say," Anderson said. 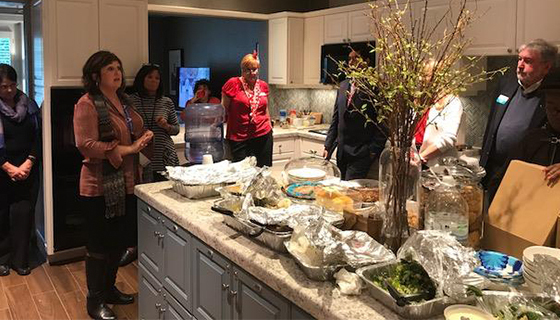 The home is the first of its kind in the state, though 76 others exist across the country, and is used to house sick veterans' families, or the vets themselves if need be, according to Vicki Johnson, house manager and 20-year veteran of the U.S. Air Force. It's also the first Fisher House located in a residential area. Looking for a way to help the inaugural facility, VFW officials said they worked out the deal with the local eatery, only expecting to secure two or three chairs maximum. But six total chairs, each displaying a symbol of a separate military branch, now rest on the home's porch, giving visitors who lodge there a place for outdoor respite. 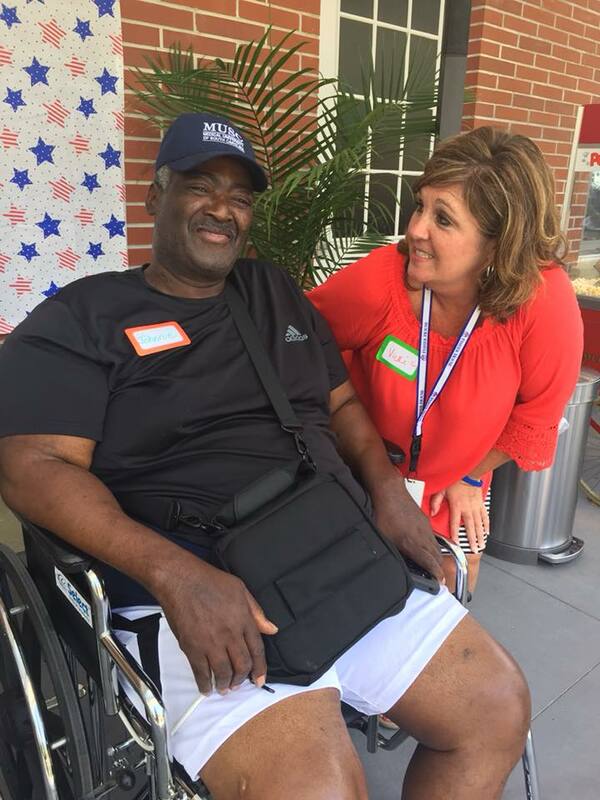 Since opening its doors on Jan. 10, the Fisher House has welcomed more than 60 veterans' families in need of a free place to stay while a loved one receives care at the Ralph H. Johnson VA Medical Center, MUSC and any other hospitals in the Lowcountry and 22 total coastal counties, Johnson said. The home has 16 total suites and averages 10 to 11 families per night. "If you ever see the Fisher House, then you'll know. It's not a house; it's a home," said Beth Tuft, guard for the S.C. Auxiliary Department. Without the lodging, many families who can't afford multiple nights in a hotel would have to sleep in their cars in parking lots, according to Johnson. 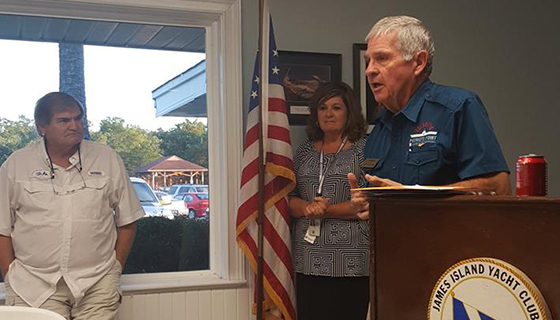 Summerville Mayor Wiley Johnson, also an Air Force veteran, praised Cracker Barrel's role. 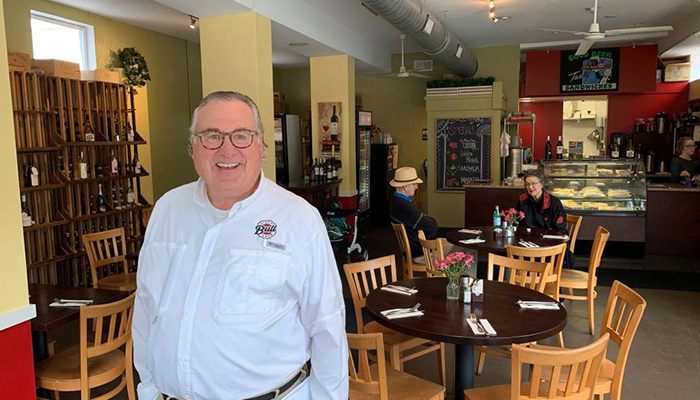 "We're here to honor Cracker Barrel for being such a good citizen, and we're looking forward to having more and more," he said of future town businesses. 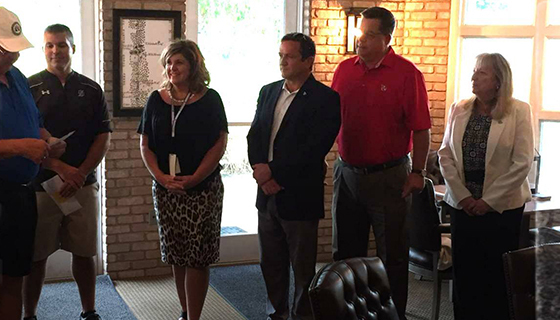 Both Wiley Johnson and Vicki Johnson attended a special luncheon at the restaurant on Friday to honor Anderson, who couldn't help but tear up when VFW ladies presented her with a special plaque. "We had no place to put our family up," Anderson said about her grandpa's hospital stay in Charleston during the 1980s. Also in attendance Friday, and proudly dressed in patriotic colors and symbols, were state leaders from The Military Order of the Cootie Auxiliary and several Ladson VFW Auxiliary members. 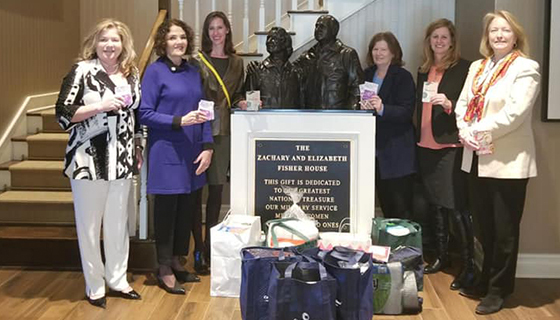 The Fisher House relies solely on community donations to operate, and Vicki Johnson said the local one has received financial support from thousands of organizations, many of them veteran-related. 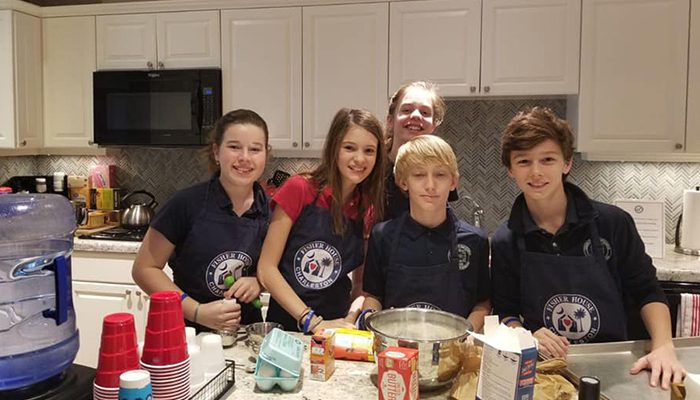 For more information on volunteering or donating, call 843-805-8200; visit the website;or find Friends of Fisher House Charleston/Grand Strand on Facebook. 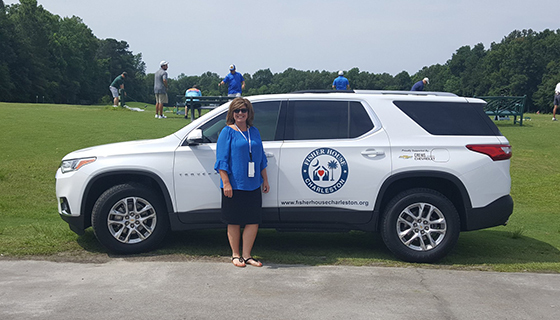 HUGE thank you to Friends of Fisher House Charleston and Crews Chevrolet for helping get a car donated to our Charleston Fisher House—a brand new 2018 Chevy Traverse! 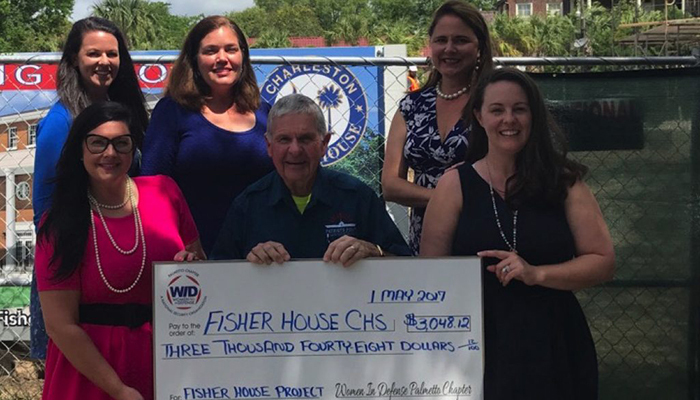 “Crews Chevrolet could not have been kinder to us to help make this deal happen!” -Bob Crawford, Friends of Fisher House Charleston transportation chair. 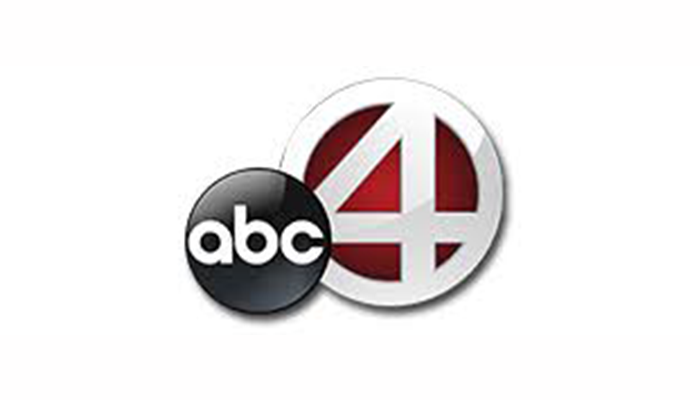 For more information on how to donate to The Ralph H Johnson VAMC Fisher House call 843-805-8200. An opportunity of a lifetime… that’s how I would describe my job as the Ralph H. Johnson VA Medical Center Fisher House Manager. After spending 20 years in the Air Force and moving to Charleston after retirement, I was hired to work at VA. I started in the Public Affairs office and then moved to Voluntary Service, before being selected as the first manager of Fisher House Charleston. It’s absolutely the best job I’ve ever had! 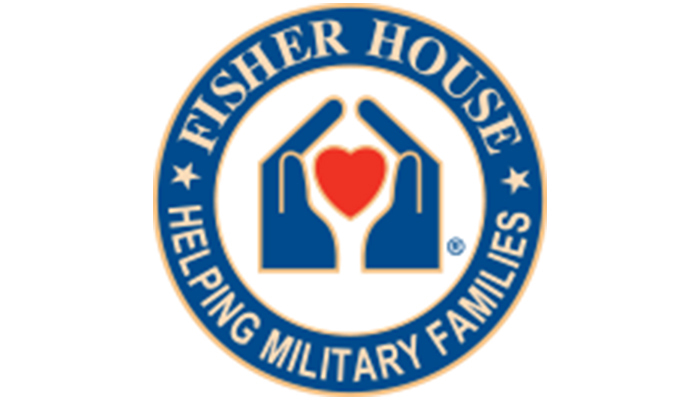 After deploying twice to Afghanistan and a trip to Iraq, I knew that when I retired I still wanted to serve in some capacity, and working at Fisher House allows me to do just that. Now I get to serve the families of the men and women who have served our country. The family members may not have worn a uniform but they still sacrificed as they supported the Servicemember, and this is my opportunity to thank and support them. 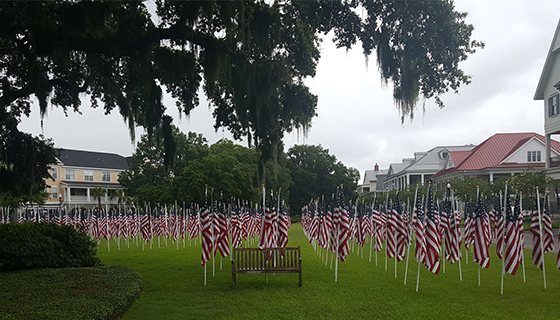 Fisher House Charleston recognizes the importance of the aid it provides our Veteran's Families. Embroidered robes and other amenities shares the pride in the House. 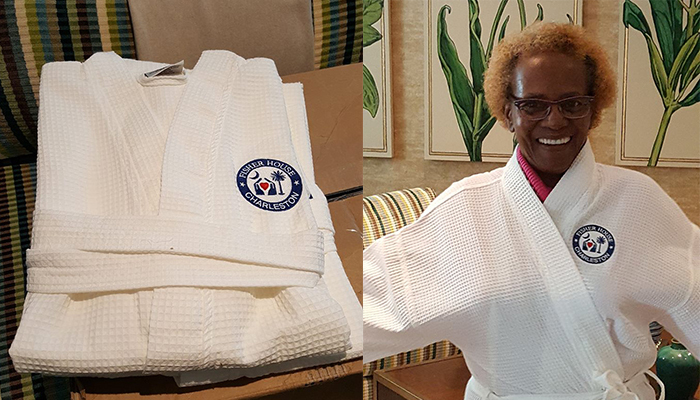 One of our first guests models monogrammed robe furnished to every room by your donations. 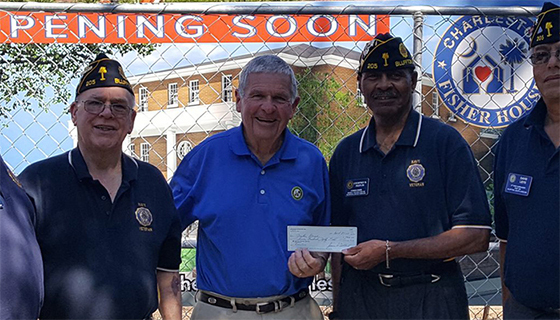 SC American Legion Deputy Commander and Post 193 Chapin member Walt Richardson presents $500 check to Fisher House Charleston. Josh and Kent receive the latest donation from our great supporters from Palmetto Chapter Women in Defense [L-R] Valerie Warnock, Amanda Stewart,Kristin Smith, Kelly Russ and Maura Boselowitz. First presentation in our new house! Our Secretary Andy Francis with Parent's Cafe members of Old Saint Andrews Parish Church. This is only one of the many donations we have received from this great parish! 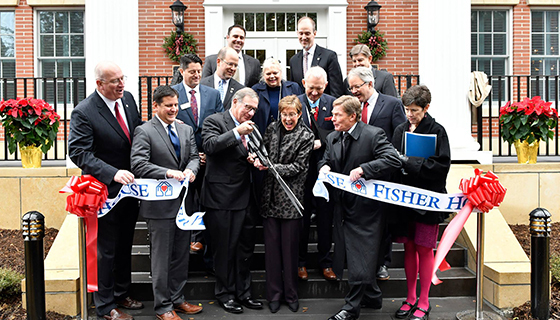 We were so excited to cut the ribbon today on our new Fisher House and we are even more excited to welcome our first families into the home soon. Thank you to Fisher House Foundation, The Fisher House Charleston, the many donors and the Charleston community for their support to make this Fisher House a reality! Look at all that lumber! We just popped on by to check on things at the site and was greeted by one of the wonderful construction crew members beginning the framing of Fisher House Charleston. 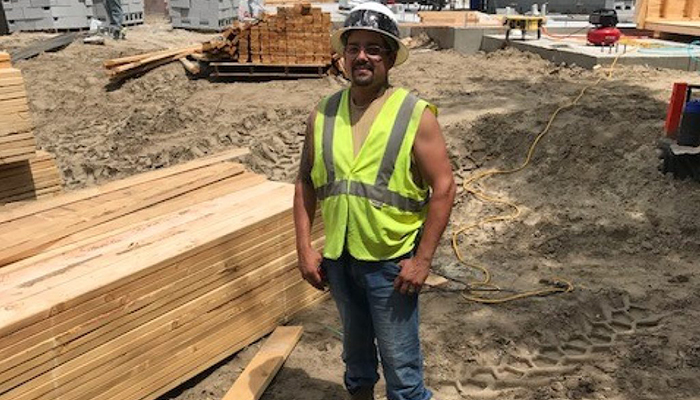 Andres says the building will be entirely framed within 6 weeks! The Palmetto Chapter of Women in Defense [WID-PC] continue to support Fisher House Charleston. One of our earliest supporters, they have raised over $15,000! 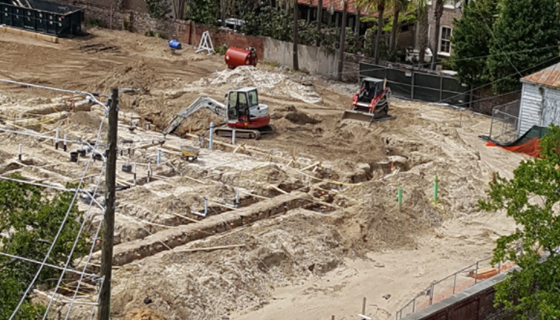 As of late April 2017, the Fisher House Charleston property has been cleared and foundation is being poured. We can see progress since March’s update! 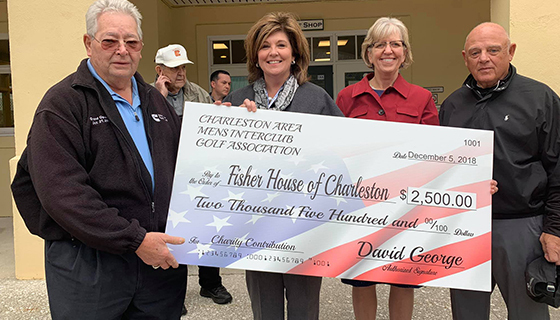 The Dennis J Becker American Legion Post 205 recently held a golf tournament for the benefit of Fisher House Charleston. 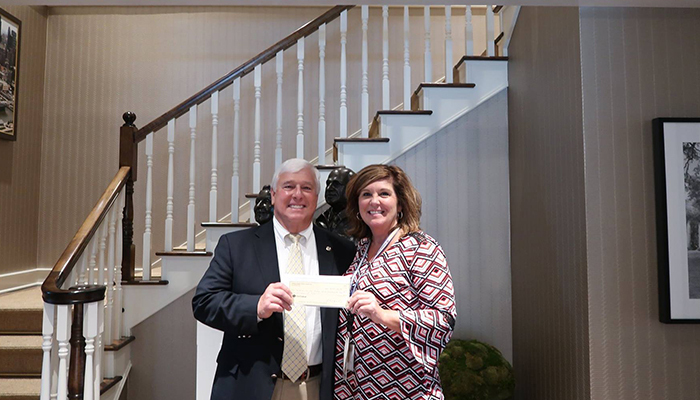 Courtney Peoples Post Commander presents a $750 check from the proceeds to Kent Hutchingson, Co-Chairman/Treasurer of Fisher House Charleston. Also visiting 150 Wentworth [l-r] are Adjutant Michael Miranda, past Post Commander Bob Sterling, and Second Vice Commander Davis Leite. College of Charleston’s Phi Gamma Delta fraternity successfully raised and donated over $5000 to Fisher House Charleston from their 5th annual fund raiser. This great support, of over $24,000 to date, will continue as the house becomes operational later this year. 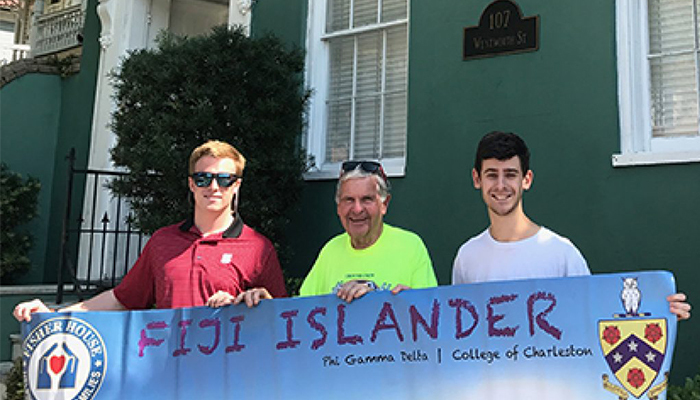 College of Charleston’s Phi Gamma Delta is excited to announce their 5th Annual Fiji Islander Philanthropy week will be April 3-7! 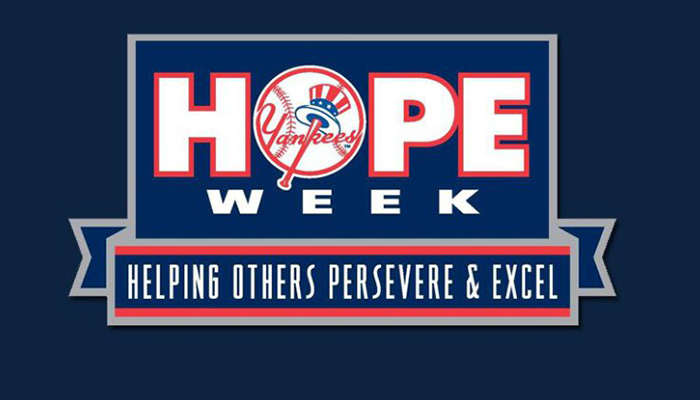 And we are extremely honored that they have chosen to support Fisher House Charleston. 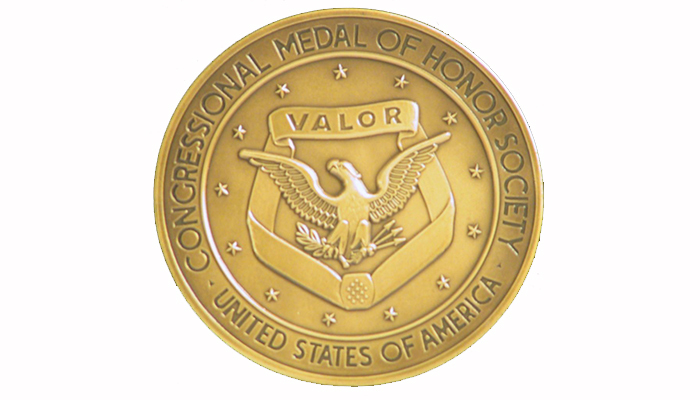 What a wonderful and well deserved honor for the FISHER HOUSE FOUNDATION to receive the 2017 Congressional Medal of Honor Society Citizen Honors Award! Since 2008, the Congressional Medal of Honor Society has selected U.S. citizens and community organizations for their acts of courage and selfless service which epitomize the American spirit.This year they have chosen Fisher House Foundation as the community organization recipient of their 2017 Citizen Honor Award. The recognition ceremony will be at Joint Base Myer-Henderson Hall in Arlington, Virginia, on National Medal of Honor Day, Saturday, March 25, 2017. The famous Washington Light Infantry has taken a great interest in the construction of Fisher House Charleston. Following a 2016 briefing to them by Board Member BG Gil Harper USA, they generously donated $5000. 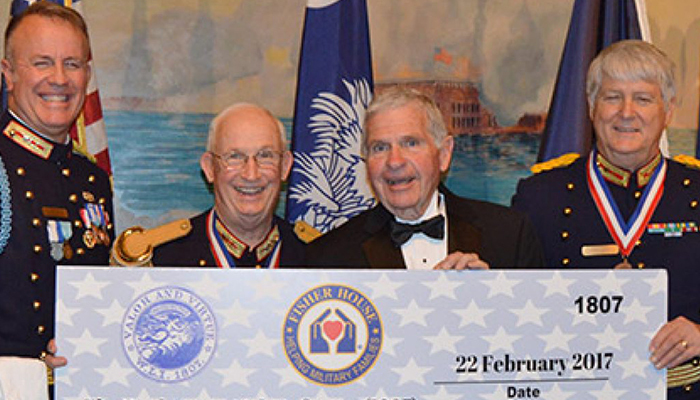 Pictured in the check presentation held at their 210th Anniversary Banquet are Toastmaster Captain Adam Sutton, MG Henry Siegling, Kent,and L/C Dale Thieling. As of early March 2017, the property has been cleared. We here at Fisher House Charleston are waiting with bated breath for something noticeable to happen! Harley Davidson of the Low Country supports Fisher House Charleston. 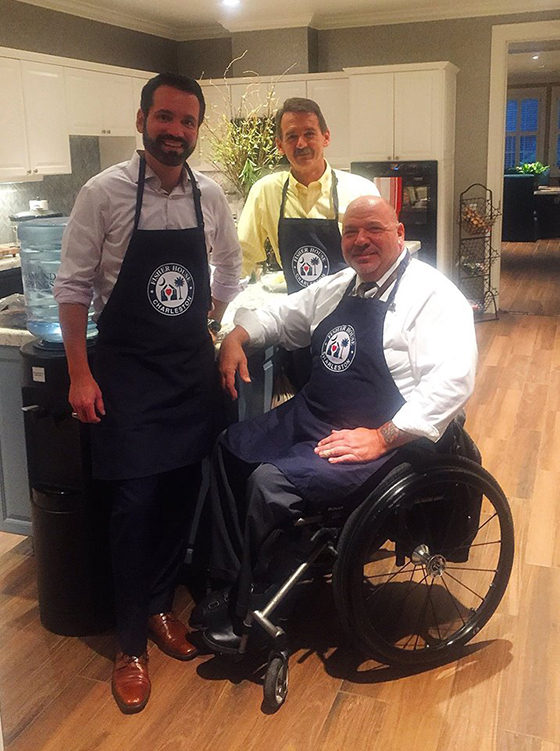 On the 8th of October 2016, the Low Country Harley Davidson Store in North Charleston held the 4th Chili Cook-Off competition for the benefit of Fisher House Charleston. Marketing manager Kelly Carroll presents the $1744 check from the proceeds to Kent Hutchinson. We treasure this relationship which began with Durbin an Trux Emerson since 2013. Every day we get closer to helping veteran families. 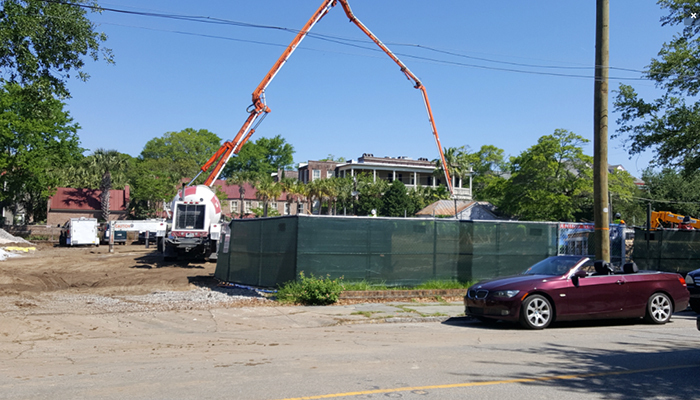 After looking at today’s demolition progress, it is hard to believe that the Fisher House Charleston’s Groundbreaking ceremony was roughly two weeks ago. 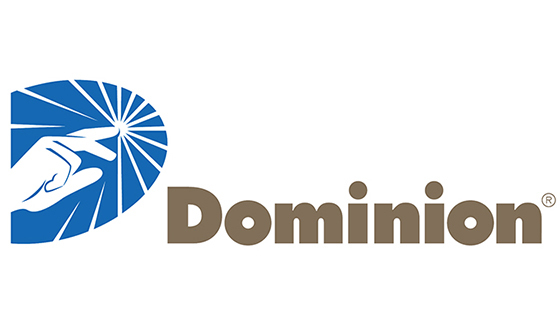 This philanthropic arm of the Dominion Companies annually supports numerous programs, volunteer activities and charitable giving in the communities they serve with $20 Million that is derived from shareholder dollars. The main focus is to improve physical, social, and economic well being of the communities served with emphasis on Basic Human Needs, Environmental Protection, Education and Community Vitality. 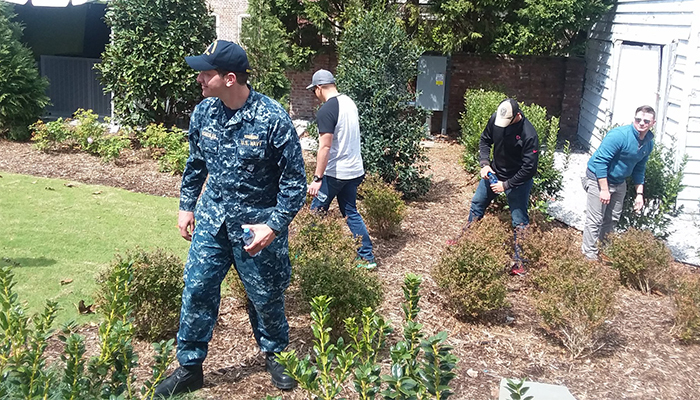 We were reminded of the history of how securing a much needed Fisher House in Charleston was an impossible feat due to the limited land on the peninsula, where the Ralph H. Johnson VA Medical Center is located. And that three angels [Maj. Gen. James E. Livingston, USMC (ret. ), Truxtun Emerson and Durbin Emerson] had a brilliant plan to make the impossible possible. The Master of Ceremonies was Maj. Gen. James E. Livingston, USMC (ret.). The Invocation was delivered by Maj. Gen. Charles C. Baldwin, USAF (ret.). Keynote Speaker was The Honorable Sloan D. Gibson, Deputy Secretary of the U.S. Department of Veterans Affairs. Remarks were made by Ken Fisher, Chairman and CEO, Fisher House Foundation; Durbin E. Emerson, Co-Founder of Fisher House Charleston; Leslie Wiggins, Network Director, VA Southeast Network; Scott Isaacks, FACHE, Director and CEO, Ralph H. Johnson VA Medical Center; The Honorable John Tecklenburg, Mayor of Charleston. Co-Founder, T. Truxtun Emerson, was unable to attend personally, but was able to be a part of the day via video. Watch Trux’s video here. Fisher House Charleston will provide a comfortable refuge for families of patients at the Ralph H. Johnson VA Medical Center. 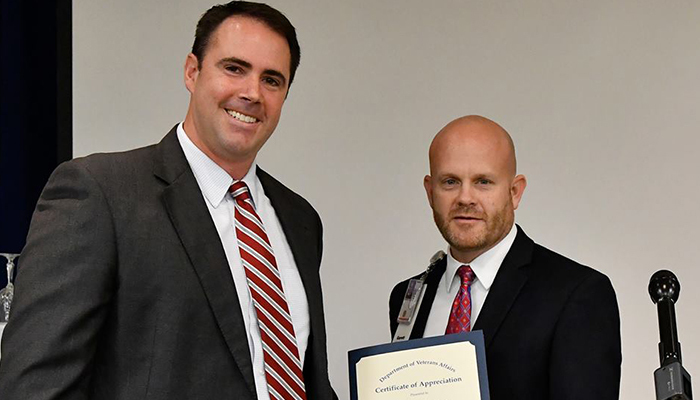 Ralph H. Johnson VAMC provides health care for Veterans in 14 coastal counties from Myrtle Beach, South Carolina to Hinesville, Georgia and is one of the most highly rated VA hospitals in the country. 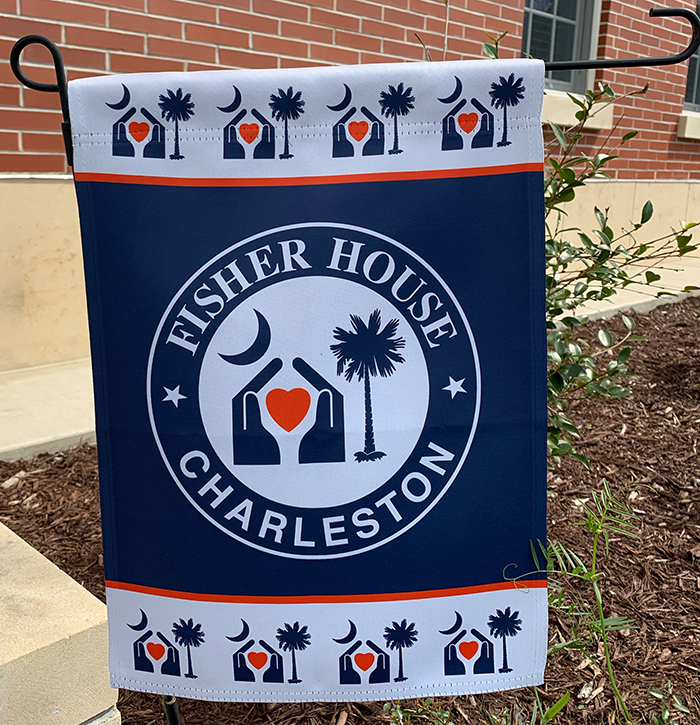 The purpose of Charleston’s Fisher House is to demonstrate how we care for those who have served by eliminating room and board expenses to Veteran families while keeping them safe and close to their loved one as the Veteran receives medical care. Once completed, the Charleston facility will be a 16-suite home-away-from-home for these families. Fisher House Charleston is a true community effort that started with a local grass-roots movement lead by Trux and Durbin Emerson. 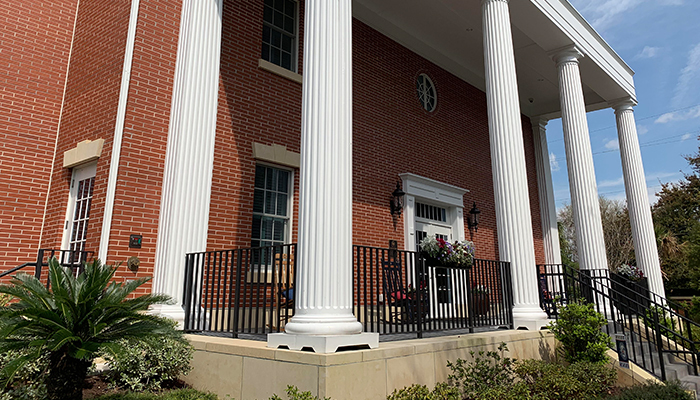 Over the past four years, they have worked tirelessly to ensure land was purchased and donated to the Department of Veterans Affairs, and forged a strong partnership with both the Ralph H. Johnson VA Medical Center and the Fisher House Foundation to make this dream a reality. Over $3 million in lodging costs saved for VA Fisher House Guests. 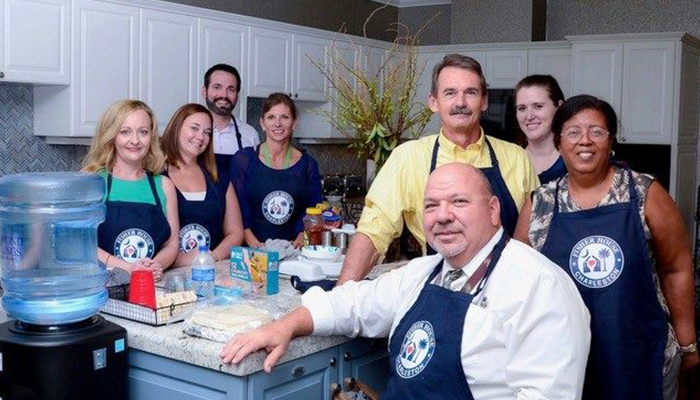 8,083 volunteers provided 44,902 hours of service to directly support VA Fisher Houses. 82% average VA Fisher House occupancy rate. 6.1% days average VA Fisher House length of stay. 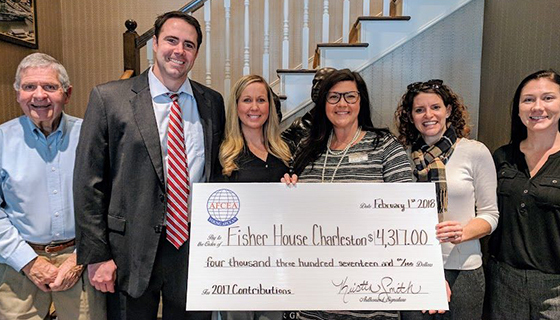 On November 13th, Kent Hutchinson, was privileged to brief Charleston’s Eliza Lucas Pinckney Chapter of the NSDAR on Fisher House Charleston’s status. 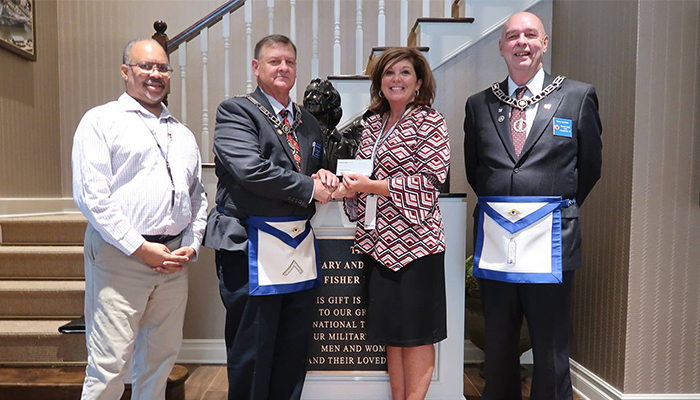 Following the briefing, Ms. Mary Lucas demonstrated the chapter’s support to our military with a $500 donation to Fisher House Charleston. 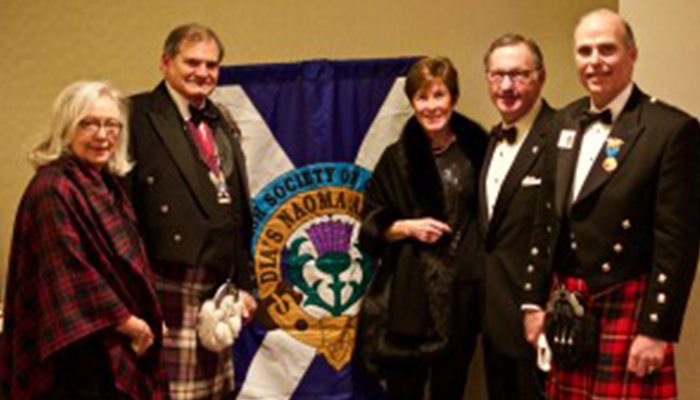 We look forward to continuing support and interface with the ladies of the DAR. 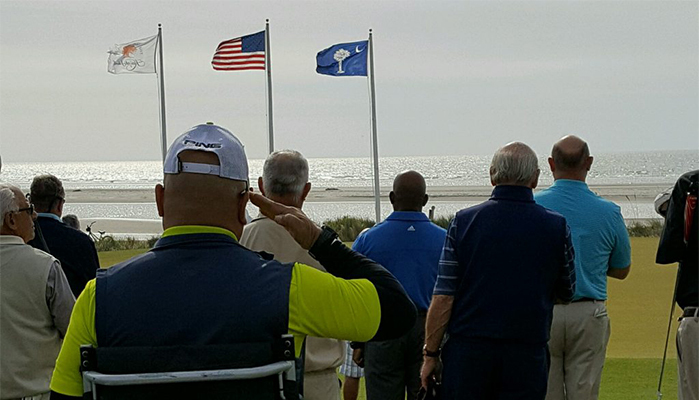 The Seabrook Island Golf Club hosted the Kiawah-Seabrook Exchange Club Veteran’s Day Golf Outing. 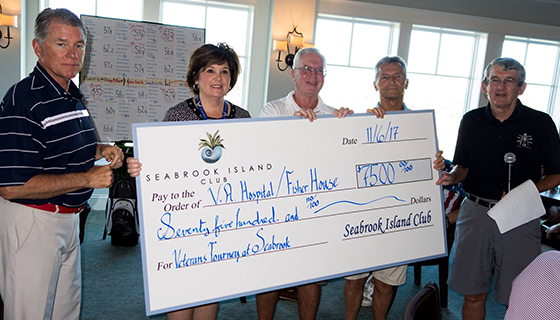 Over $9000 was was donated to the Ralph Johnson VAMC/Fisher House Charleston Team. Much thanks to Allan Armstrong who organized this annual event. Over 60 veterans were feted during the Fisher House Charleston Veteran’s Day golf outing. Medal of Honor recipient MG Livingston USMC [ret] addresses the players prior to the playing of the National Anthem. Veterans played for free while major funds were raised for the new house which will open in 2017. On November 18, 2016, please celebrate with us the GROUNDBREAKING for Charleston’s long awaited Fisher House where before too much longer we will finally welcome Veterans and their families to their home away from home. After a year of taking into consideration all of the feedback from individual, city and state consulting parties, the Fisher House Charleston has been entirely redesigned to be more architecturally compatible with the historic neighborhood where it will be built. 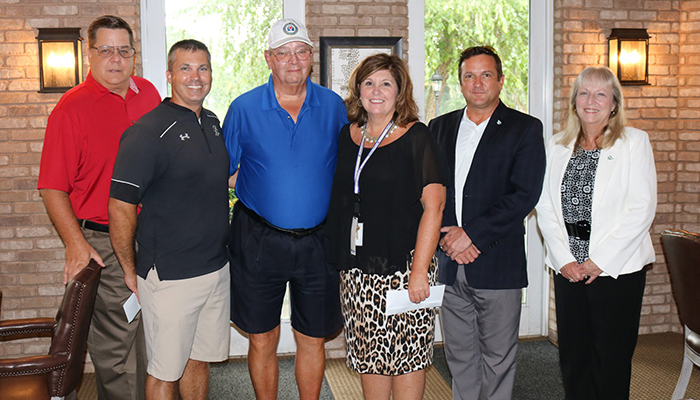 Ken Zachary and Jerry Stumbras of the Del Webb Golf Club and Alan Fisher and John Sisto of the Del Webb Veteran’s Club present Kent Hutchinson checks totaling $5000 from the October 24th golf outing and Club support. Congratulations to LTC W. Larry Dandridge, Ret. Author of BLADES OF THUNDER (BOOK ONE), retired Army Aviator Lt. 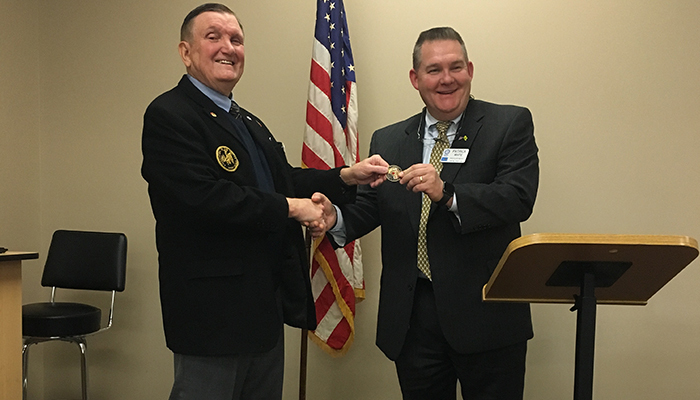 Colonel W. Larry Dandridge was recognized, along with 11 other local area seniors, yesterday by The Greater Charleston Chapter of National Aging in Place (NAIPC) Council as a low country SC community role model. Larry was specifically recognized for his volunteer work and his commitment to live life to the fullest as a Patient Adviser Volunteer at the Ralph H. Johnson VA Medical Center; his volunteer work helping troops, veterans, and their families as the VP of Veteran Affairs and Past President of the Charleston, SC Chapter of the Association of the US Army (AUSA); and for his efforts as an avid fund raiser for FISHER HOUSE CHARLESTON. His latest book, BLADES OF THUNDER (BOOK ONE), was written to help raise awareness and money for FISHER HOUSE CHARLESTON, to honor the 42 members of his flight class who gave the last full measure in Vietnam, and to commemorate 50 years since America’s longest and most controversial war. Larry’s book sales, his motivational speeches, and book signings have raised more than $60,000.00 for FISHER HOUSE CHARLESTON in the past year. Ft. Sumter Life Members Club President Martin Duane and Secretary Luki Wong present Co-Chairman Kent Hutchinson a generous donation of $5000. 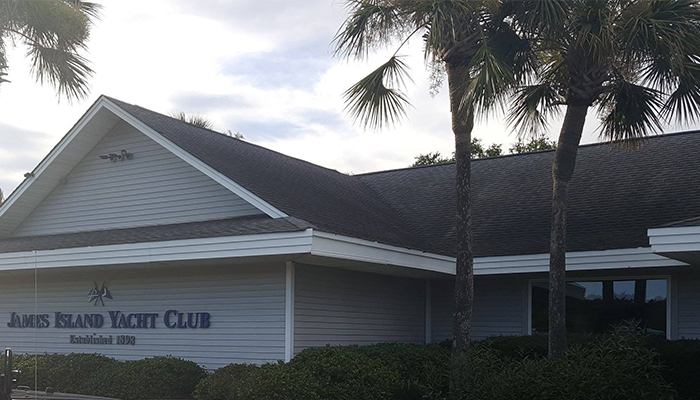 The club has a history of supporting a number of Low Country Area Charities and expressed interest in opportunities to continue support when the house opens. Cane Bay Del Webb Vetmates, Maggie Johnson and Treasurer, Marty Harris present Kent Hutchinson a check for $2485. 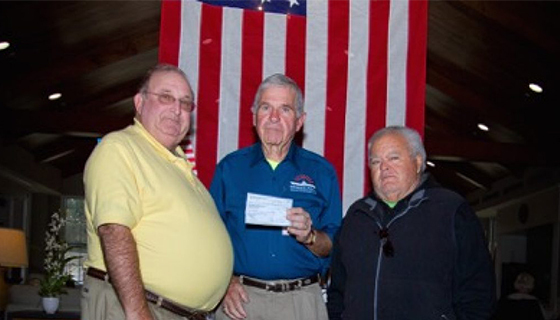 The funds were raised via the Memorial Day Poppy donations and the Duck Races held during the 4th of July Picnic. 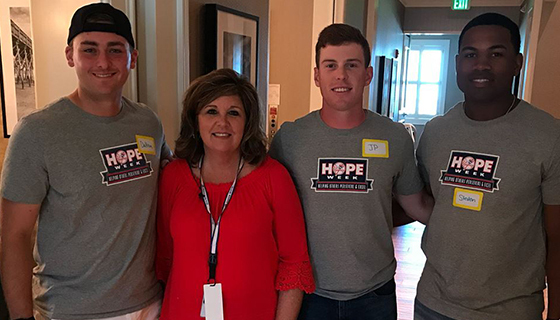 Cane Bay Del Webb has been a regular supporter and the men’s golf group is sponsoring an October 24 Golf Tournament at Crowfield as their next fund raiser for Fisher House Charleston. We truly appreciate their continuous enthusiasm and support! 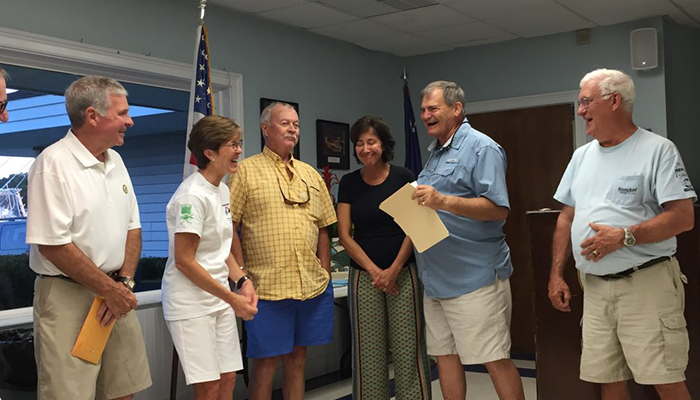 Trux, Kent and Durbin get ready to receive check[s] totaling over $11,000 from William Mc Daniel and the rest of the committee for the James Island Yacht Club 5K Run/Walk and Golf Cart Race held May 21st. Mary Ann Aimars [ctr] ran the Kentucky Derby Marathon in April and raised over $5500 for Fisher House Charleston the balance was raised from the May 21 events and donations. Who said fund raising can’t be fun? 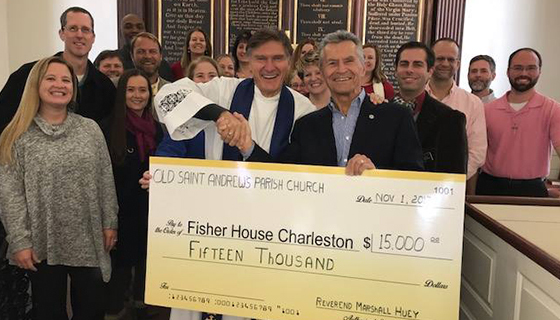 Fisher House Charleston is blessed to such fun and dedicated supporters. 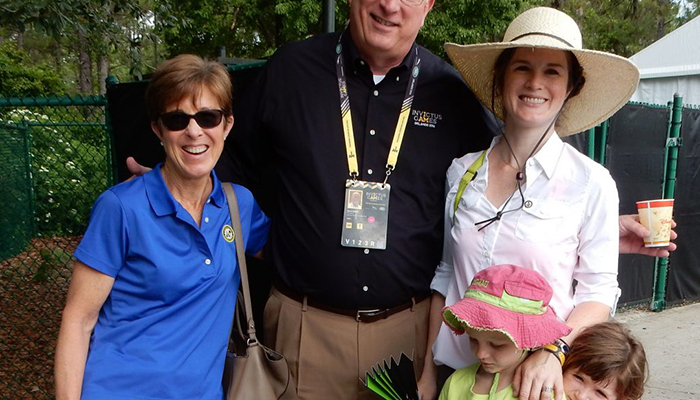 Three generations of Emersons meet Dave Coker, President of both the Fisher House Foundation and the Invictus Games 2016, at the Track & Field event at Invictus Games in ESPN Center, Orlando, Florida. 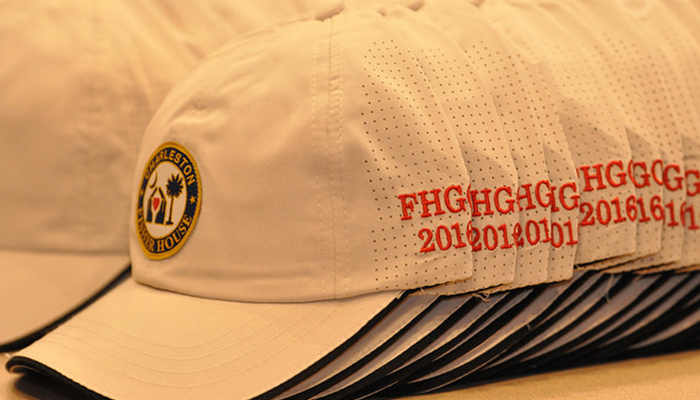 The Fisher House Foundation sponsors an annual golf classic in Leesburg, Virginia as their single fundraiser each year. 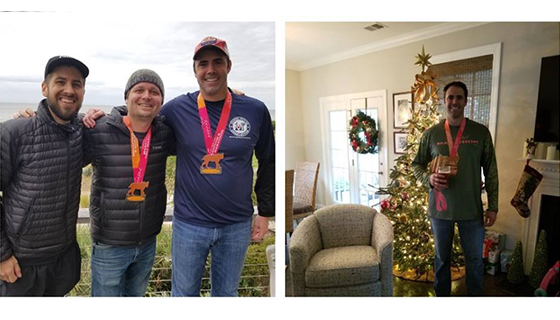 This year the Fisher House Foundation has chosen to dedicate the entire proceeds from this event to the Fisher House Charleston project in Charleston, SC. The location of this Fisher House will be 150 Wentworth Street, Charleston, SC. 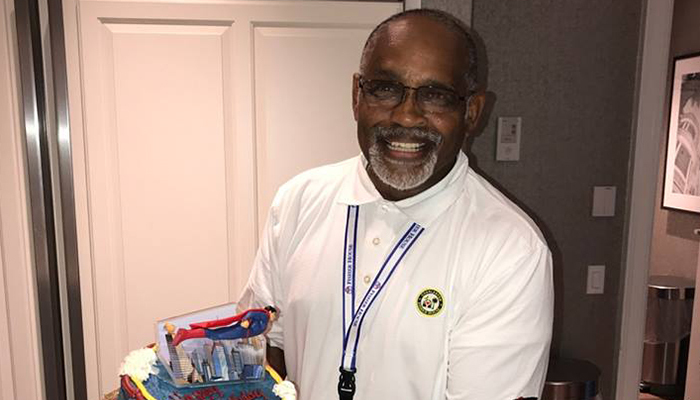 At the conclusion of this very successful golf tournament the Foundation declared that this year’s event raised $680,000+ and broke their record on the live auction items. The entire project is estimated to cost over $10,250,000 including the land. 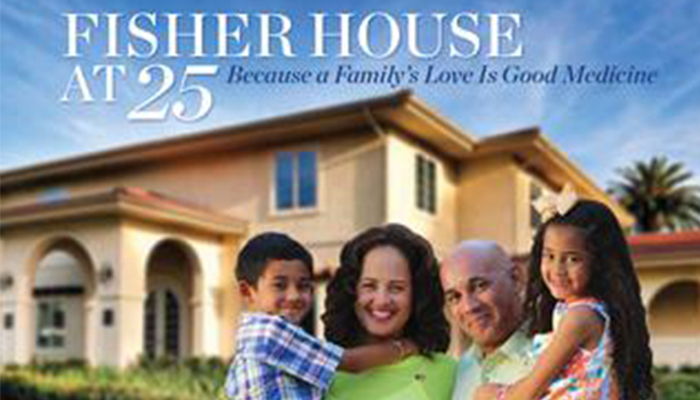 The Fisher House Foundation was founded over 25 years ago. 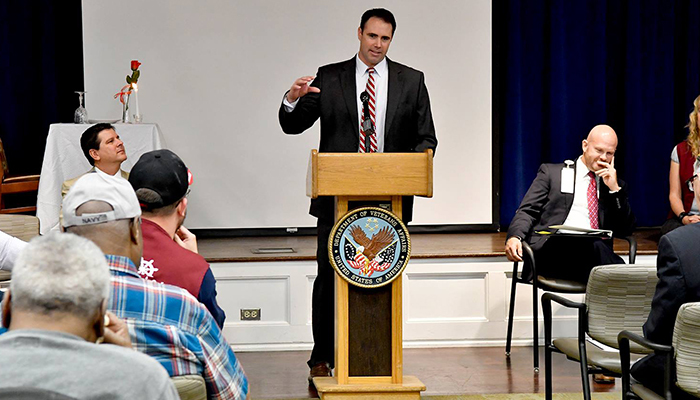 The primary purpose of any Fisher House is to provide free lodging for the families of wounded soldiers being treated at nearby Medical Centers located on federal lands. 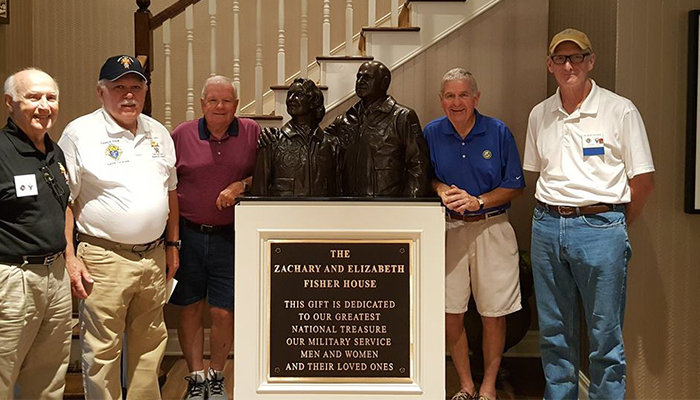 The Fisher House Charleston will serve the families of the Lowcountry from Myrtle Beach, SC to Savannah, GA. 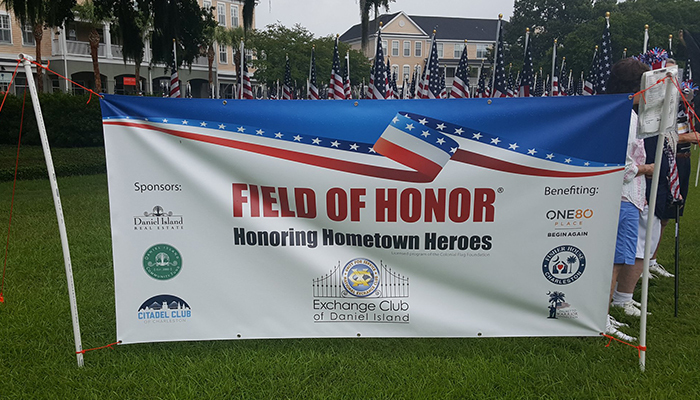 This area encompasses 22 coastal counties which serves more than 50,000 veteran families. 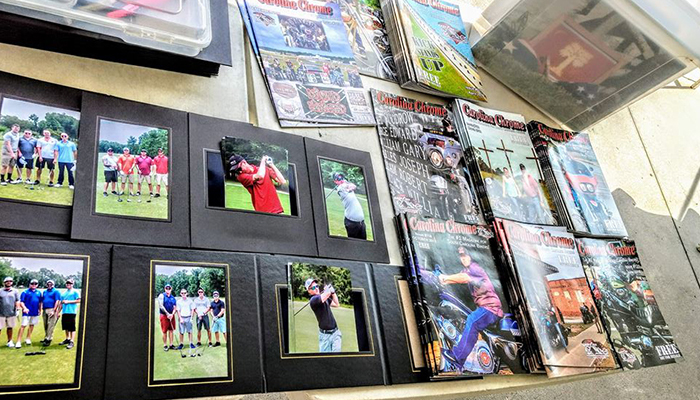 There were over 200 golfers and many sponsors who contributed to the fabulous success of this fundraiser. There were many volunteers who spent untold hours in preparation for this day. All of them turned out to make this special day seamlessly successful. Thank you Fisher House Foundation for all you have done and will do shortly for our Ralph H. Johnson VA Medical Center, Fisher House Charleston and all of the veteran families it will serve. 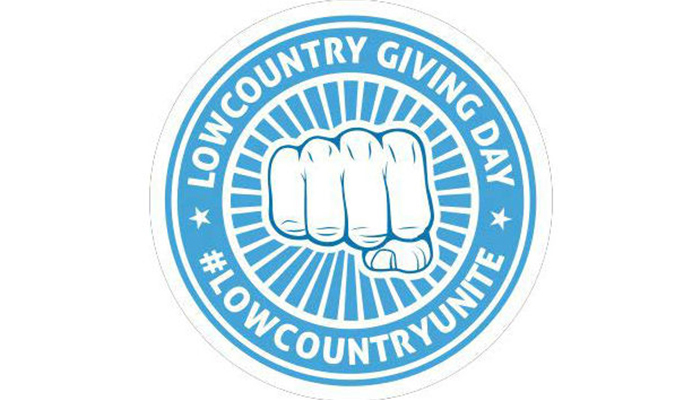 Lowcountry Giving Day is a 24-hour period of celebration of the work of our local Lowcountry nonprofit organizations to be held May 3, 2016. With each dollar donated to Fisher House Charleston through text.gives/fisherhouse or through www.lowcountrygivingday.org, a matching gift will be provided by a very generous catalyst donor. Double each dollar you give to help make Fisher House a reality by donating through Lowcountry Giving Day. Schedule your donation today! Make a difference for our veterans and their families during their time of need! Last year, over $6.7 million was raised for a variety of nonprofits to help the Lowcountry become a better place to live, grow, create and learn. This year, more than 350 nonprofit organization are participating, we expect more donors and gifts than ever before. 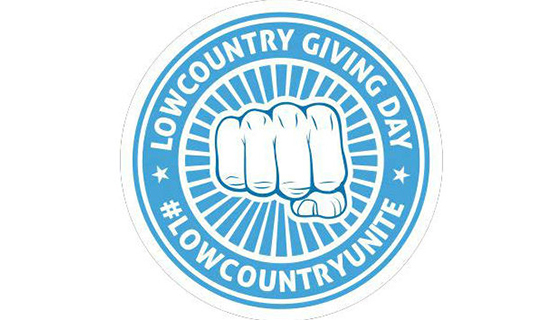 Lowcountry Giving Day is making it simpler than ever for donors and nonprofits to engage. Donations can now be received through a simple text message. A simple new way for donors to give. Donors simply text ‘FisherHouse’ to 33923 or visit text.gives/fisherhouse or www.lowcountrygivingday.org and select ‘Fisher House Charleston’ to make your donation to be matched by our catalyst donor. 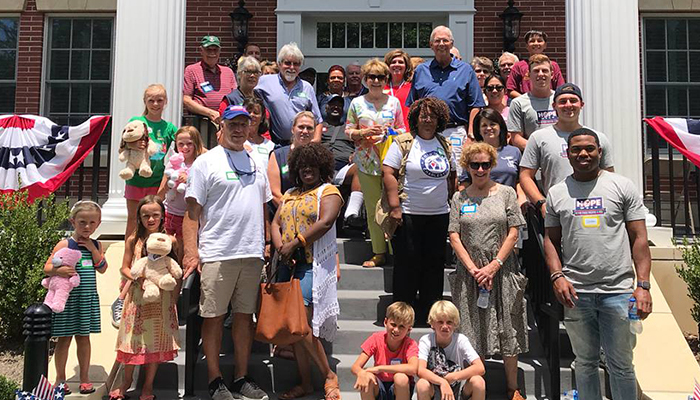 Together we can better serve the needs of those from Horry County to Savannah who call the Lowcountry home, including our veterans and their families during their time of need. Architect, Skip Wallace, with co-founder Durbin Emerson, examines the historic stable at 150 Wentworth St. 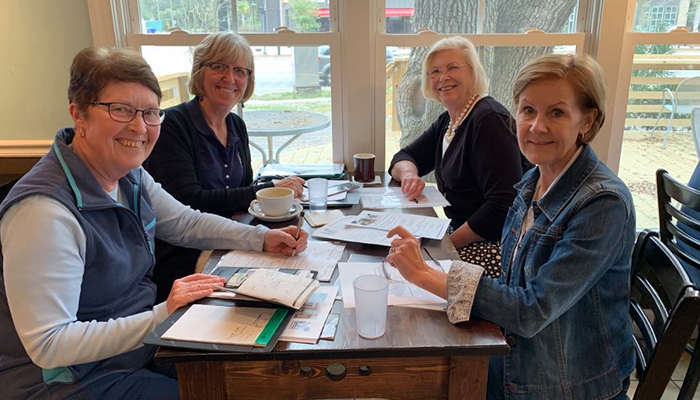 This initial trip was extremely fruitful in planning renovation ideas which includes creating much needed storage space as well as creating a library or interpretive space to include historic books on Charleston and the Lowcountry. We hope to receive the first conceptual drawings within a few weeks. There will inevitably be modifications, but these drawings will be the basis of an exceptional space for our veteran families. Ever wonder how Fisher House’s started? 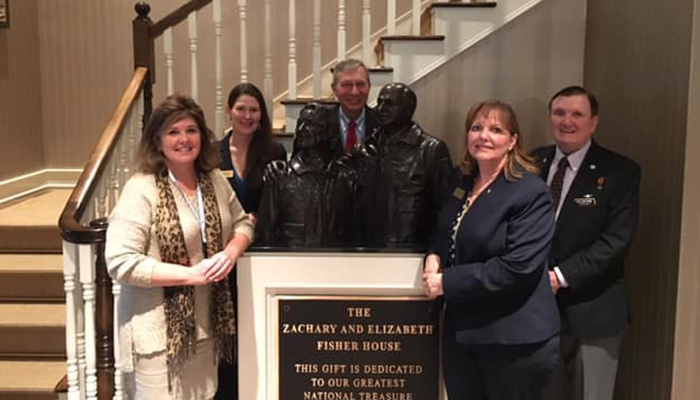 Take a look at the Fisher House Foundation history book, with photos and stories of Zachary and Elizabeth Fisher, families, and managers from the last 25 years. Fisher House Charleston can’t wait to be apart of this history book. 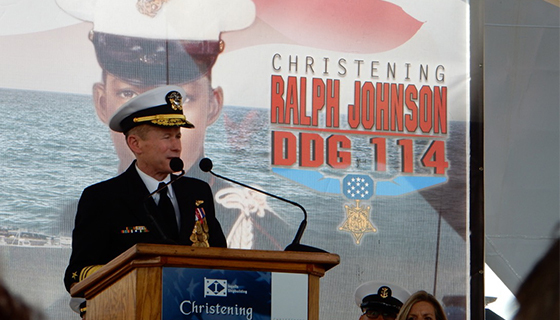 Our very own Trux and Durbin Emerson, Founders of Fisher House Charleston, eagerly accepted the invitation to the christening of the USS Ralph Johnson in Pascagoula, Mississippi on April 2, 2016. Ralph H. Johnson died in the Vietnam War at age 19 in the US Marine Corps as he heroically smothered a hand grenade with his body to save his comrades and his Company. He was awarded the Medal of Honor posthumously. 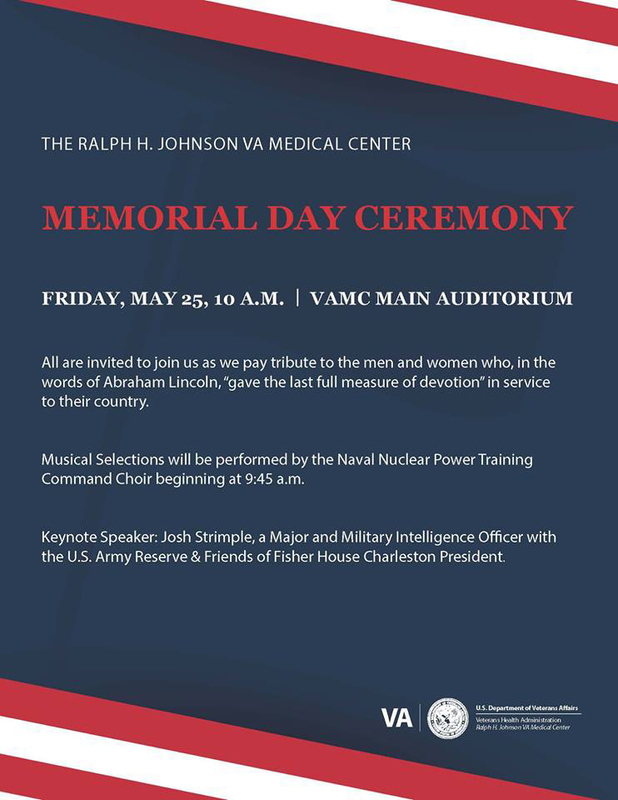 Our Veterans hospital here in Charleston is named after Ralph Johnson a native son of Charleston. 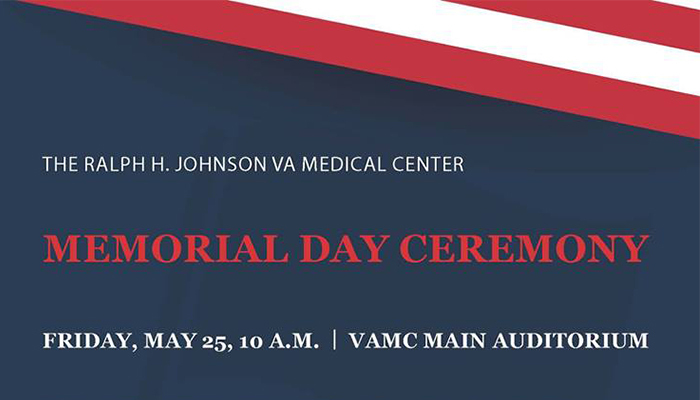 Also in attendance of this momentous occasion was: Mrs Helen Johnson Richards, sister of Ralph H. Johnson; The Honorable Roger Wicker, United States Senator, Mississippi; Vice Admiral Ted Branch, USN; Lieutenant General Ronald Bailey, USMC; and keynote speaker, The Honarable Sean Stackley. Mary Anne Aimar of the James Island Yacht Club will be participating in the Kentucky Derby Marathon (26.2 miles) in Lexington KY on 23 April 2016. 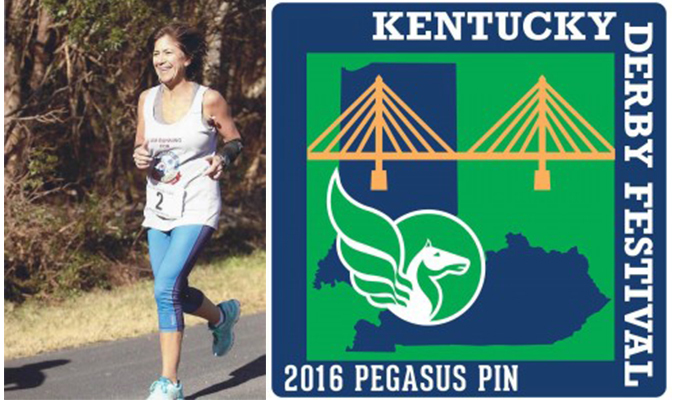 She is running in support of the Fisher House Charleston. She is asking that you support her and the Fisher House Charleston by pledging$1, $3 or $5 per mile. Pledge sheets will be available at the bar at the Yacht Club. You may write a check to Fisher House or charge your pledge to your bar tab. 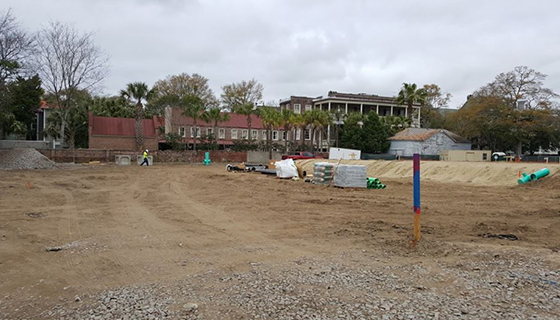 Fisher House Charleston, which is close to begin construction, will allow the families of Veterans of the Armed Forces and Merchant Marines a place to stay while their loved one is treated at the Ralph Johnson VA Center in Charleston. Your donation will show our Veterans that you appreciate their service to our country and their sacrifice. 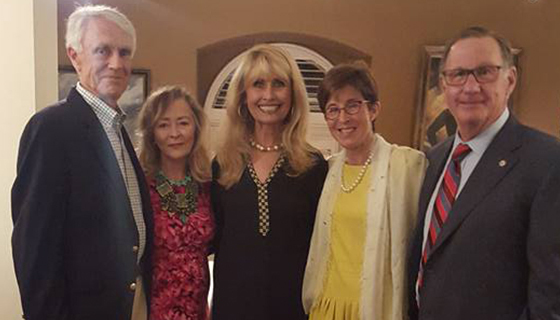 Show your support of Mary Anne as she runs for Charleston’s first Fisher House. Please share her commitment and dedication in her endeavor. 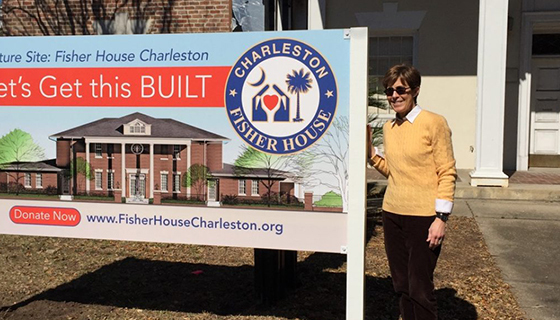 Durbin Emerson, Co-Founder of Fisher House Charleston poses next to our new sign at 150 Wentworth Street, Charleston, SC. This will be the location of the Fisher House Charleston. 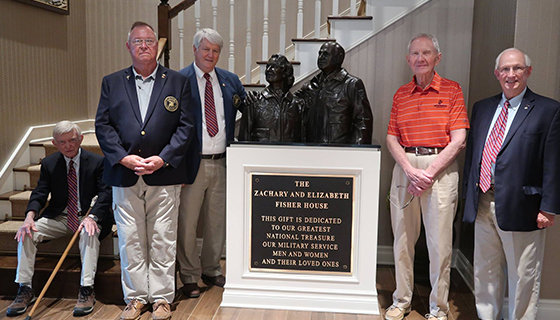 This Fisher House will be the first Fisher House in South Carolina and will serve the families of our veterans from Myrtle Beach, SC to Savannah, GA. 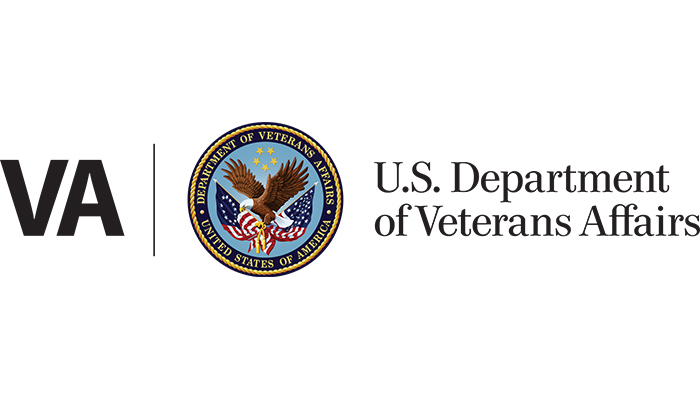 There are an estimated 55,000 veteran families in this region. 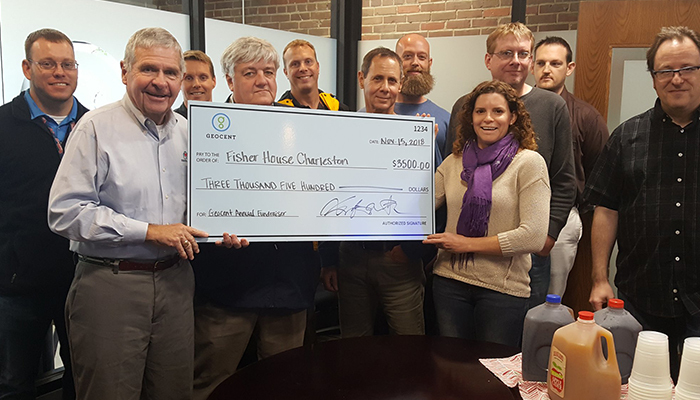 Fisher House Charleston will save veteran families an estimated $1,000,000 per year in lodging costs going forward. 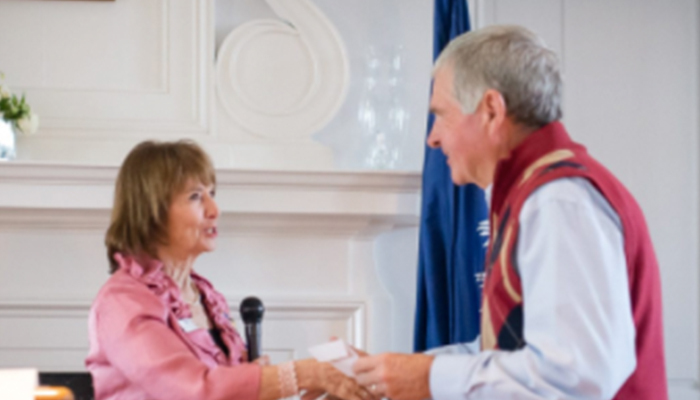 The Scottish Society of Charleston generously donated $2,500 and invited Fisher House Charleston’s founders, Trux and Durbin Emerson, to make a presentation at the annual Robert Burns Supper. 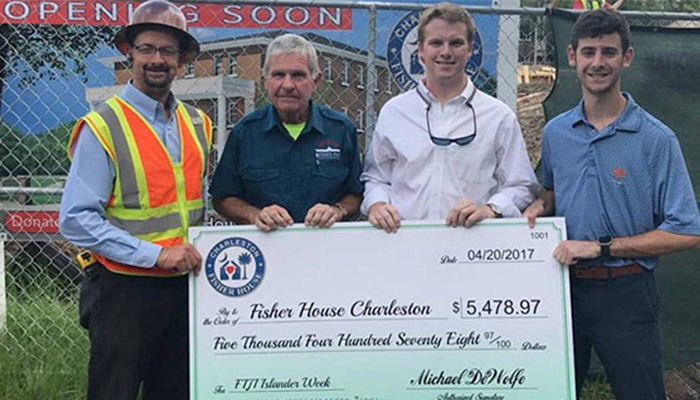 The goal of Fisher House Charleston is to raise $4.5 million to acquire and prepare a property in Charleston for construction of a Fisher House to accommodate families of patients at the Ralph H. Johnson VA Medical Center. With the amazing Fisher House Charleston Veterans Day Celebration we are dubbing the “Miracle at the Marriott”, along with the $100,000 donation from residents of Bishop Gadsden, more than $17,000 raised from Phi Gamma Delta fraternity, and the amazing efforts of our 3rd Fisher House Charleston Golf Tournament, we have had an INCREDIBLE past few months! 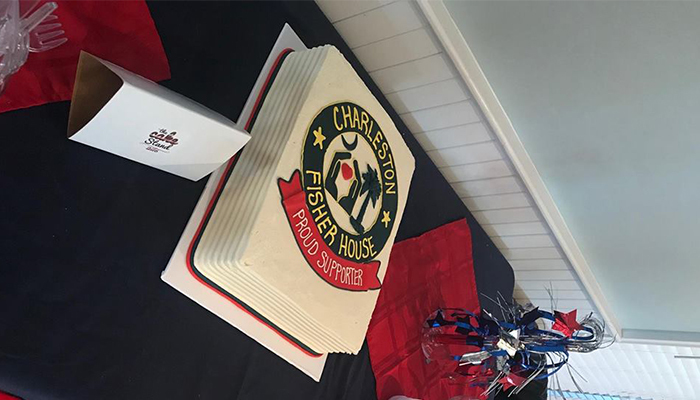 Please join me in sharing the following stories of our success and/or images of the Veterans Day Celebration on your own social media as we get the word out to encourage the pubic’s support of our efforts to build SC’s first Fisher House in Charleston. Please “Like” our Facebook Page: “The Fisher House Charleston” to be able tag our page in the post. And use the hashtag #FisherHouseCharleston and the website www.FisherHouseCharleston.org to encourage contributions through our website. With almost $3 million raised so far, we are SO CLOSE! 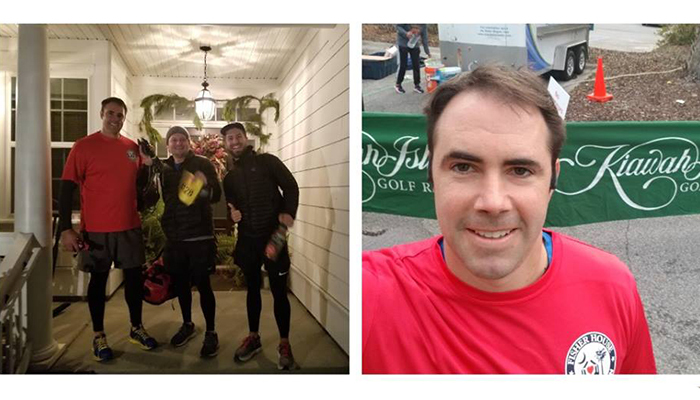 We hope to wrap up our fundraising efforts with the 2016 FIsher House Golf Classic to be held May 2nd in Leesburg, VA with all proceeds benefiting Fisher House Charleston. 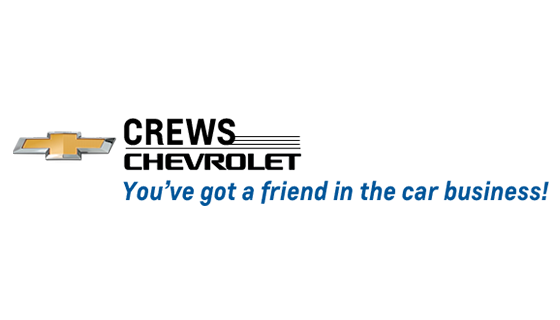 It is our hope to make that event as successful as possible, so if you know companies who want to be aligned with Fisher House and receive incredible sponsorship opportunities, please contact me. 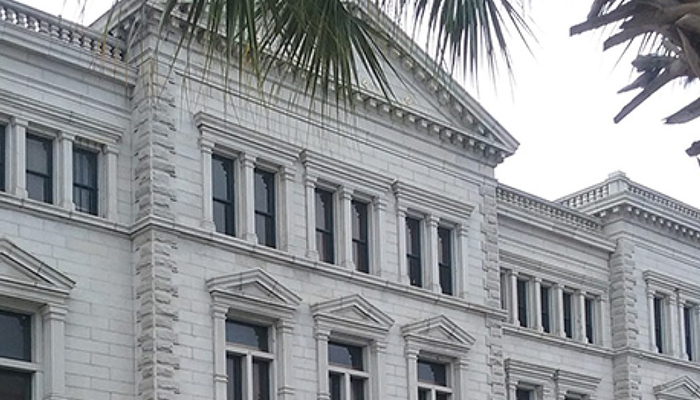 We want as many SC corporations to be engaged as possible, so please let me know if you have connections. I’ve attached the sponsorship brochure outlining the details. Images sized for social media in link below. They can be downloaded or shared on Facebook or other Social Media. And with the launch today of the #Sing2Salute social media campaign by Walmart now through December 22, you can help Fisher House Foundation received $1.5 Million in support for all Fisher Houses. Details on how to participate are here: Link Here. Lastly, we have a contribution of 100 posters to encourage public support of our efforts to compliment the billboards in the outlying areas by promoting our website. Please let me know if you have a prime location to hang a poster or are willing to help distribute to downtown Charleston retail businesses, restaurants and barber shops – anywhere with good traffic! ‘Tis the Season for generosity in support and appreciation of our Veterans and their families! 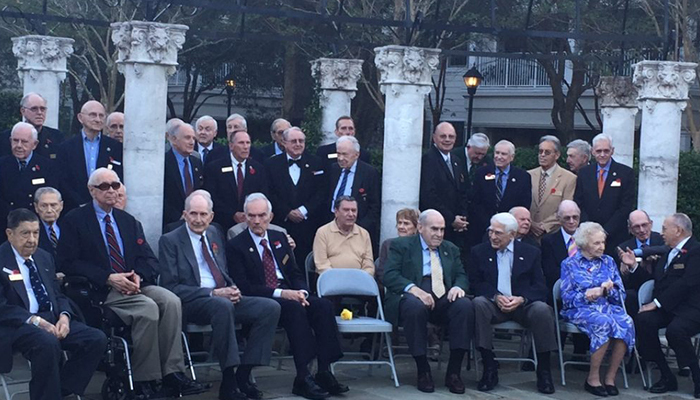 Bishop Gadsden Retirement Community in Charleston, South Carolina: November 10, 2015. These are all the veterans living at Bishop Gadsden. Several have served this great nation in three wars: WW2, Korea and Vietnam. The entire community has chosen Fisher House Charleston as their sole choice for their annual charity drive. As a result they presented FHC with a check for $100,000. Since that day they have donated a total gift of over $115,000. 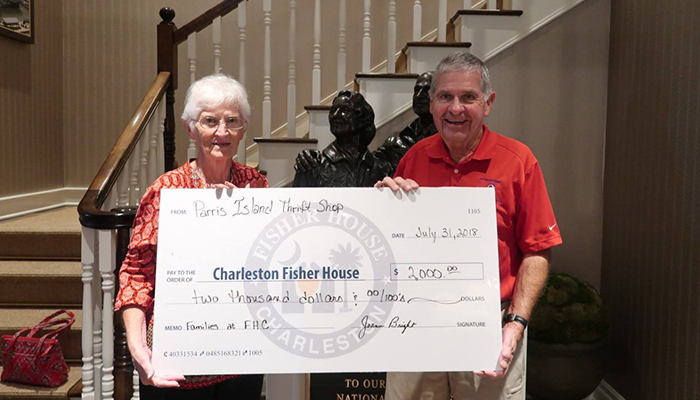 We thank all of the Bishop Gadsden community for their passionate support of Fisher House Charleston. 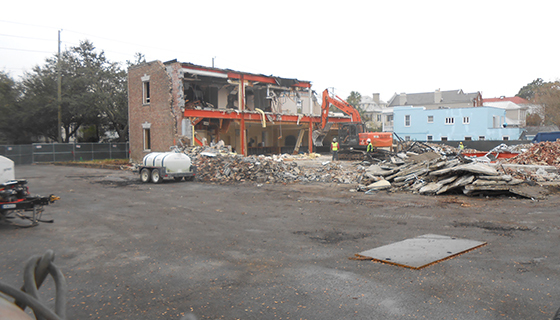 CHARLESTON, SC – November 25, 2015, Fisher House Charleston is one step closer to making the building at 150 Wentworth Street a reality. Donations from local organizations and an annual event raised more than $600,000 in just the last month. 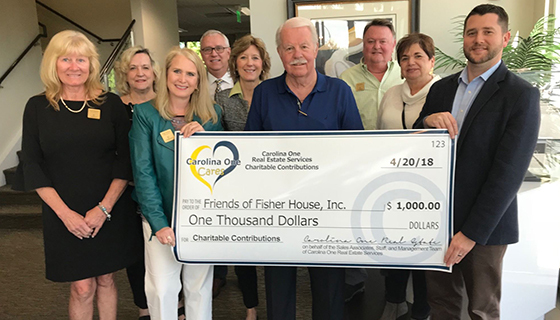 Bishop Gadsden residents recently raised $100,000 at their annual fundraiser, and elected to make Fisher House the recipient. 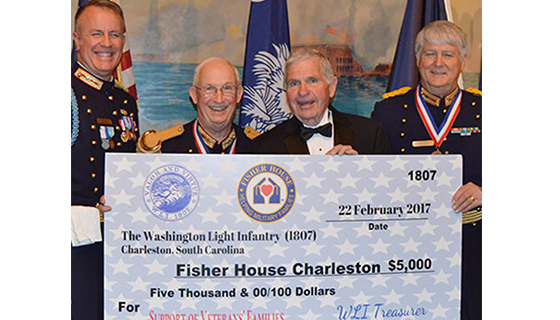 On Veterans Day, the Fisher House Charleston held their annual ball, and its live auction generated more than $500,000 in donations. 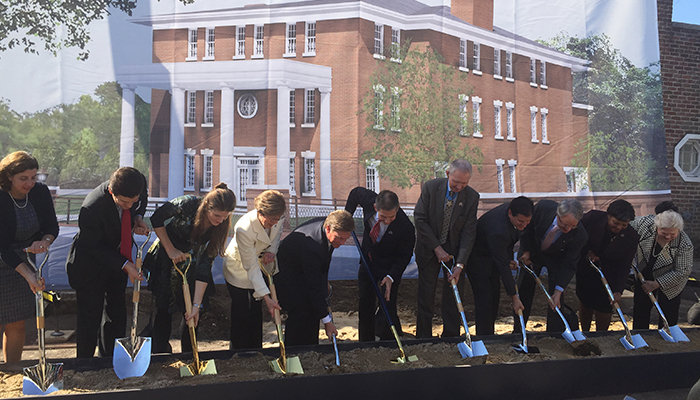 The Fisher House Charleston project will provide a comfortable refuge for families of patients at the Ralph H. Johnson VA Medical Center. Fisher House Charleston will relieve the burden of costly hotel stays so that families can focus on what is really important: visiting their family member in the hospital and not having to sleep in their vehicles or in the patients hospital room. The Ralph H. Johnson VA Medical Center, located in historic downtown Charleston, is one of the most highly rated VA hospitals in the country. The Ralph H. Johnson serves more than 4,500 veteran inpatients annually from 22 coastal counties from Myrtle Beach, SC to Savannah, GA. Charleston is a beautiful tourist-welcoming location—with that comes high dollar nightly accommodations. Not all visitors to Charleston are on vacation and can afford vacation rates.